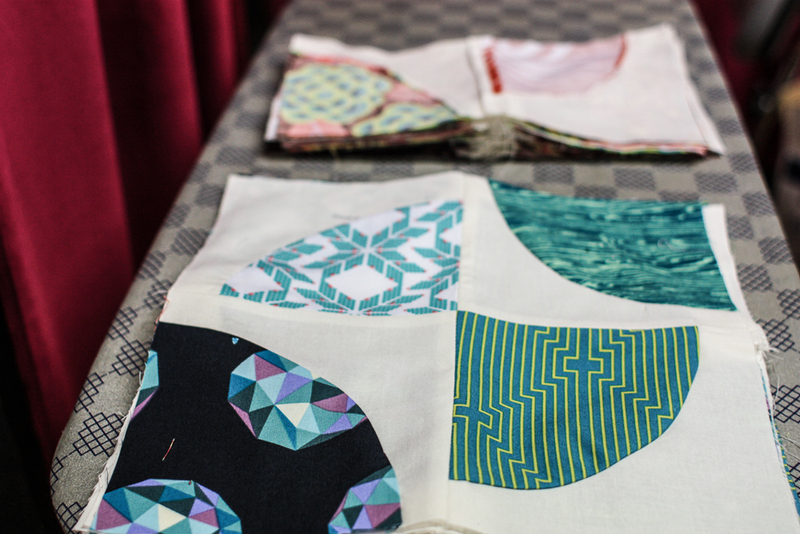 FuKiTu Sewing | Lots of things I've started and some I've finished. 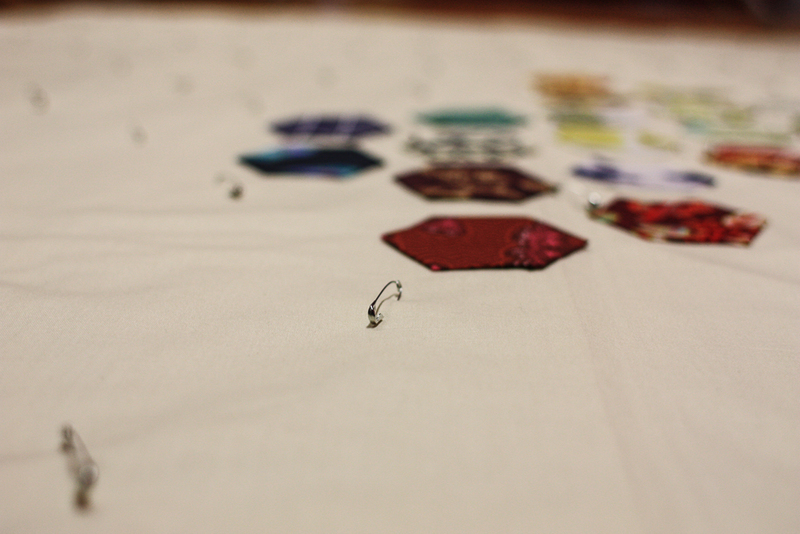 I’ve been sewing, but not updating! In fairness I’ve been doing a bunch of other things – like sewing a plush as hell black faux fur coat and then getting married in it. (I also wore a dress underneath). Not visible in the pictures: a fine dusting of fluff on everything in my studio, including all my shelves because it floated everywhere. Not a bad effort for being thrown together in two nights before the wedding though. 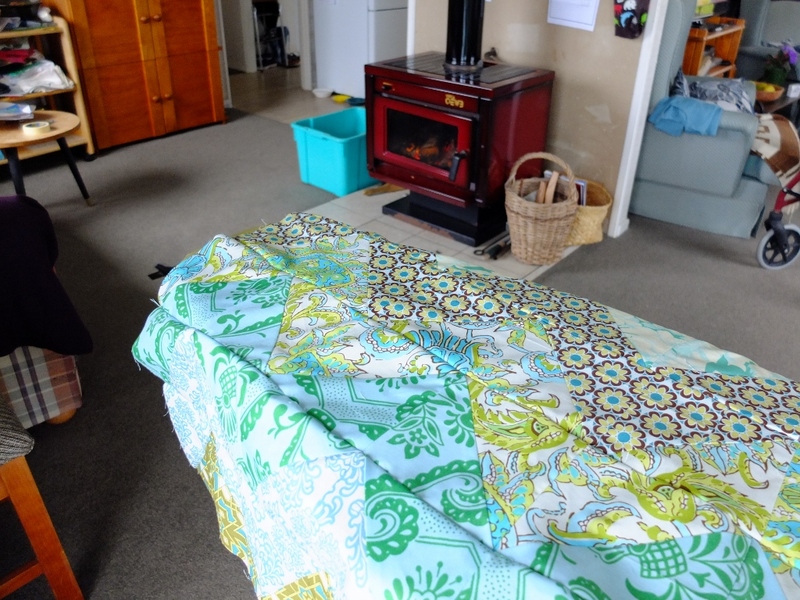 I also finished off a single bed sized quilt for a commission. I hadn’t tried this lattice pattern before and while I love the final result I think I would probably try a different construction technique in future. I do love the little aeroplane pattern on the backing though. 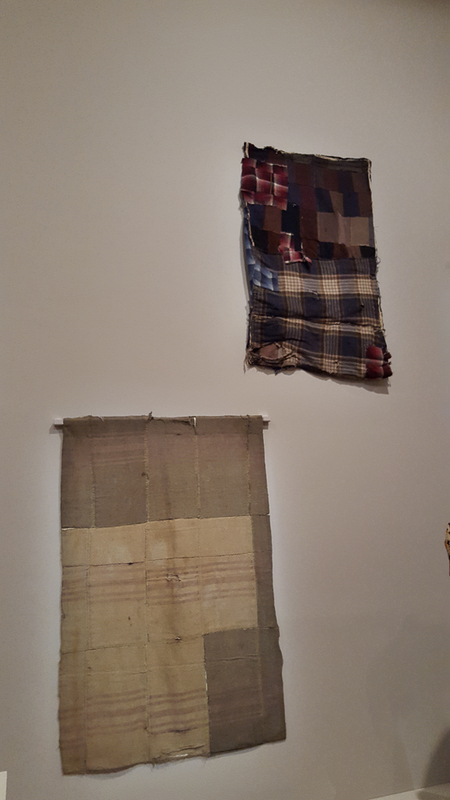 Plus when I was in Melbourne last I visited Making the Australian Quilt: 1800-1950 at the National Gallery of Victoria. 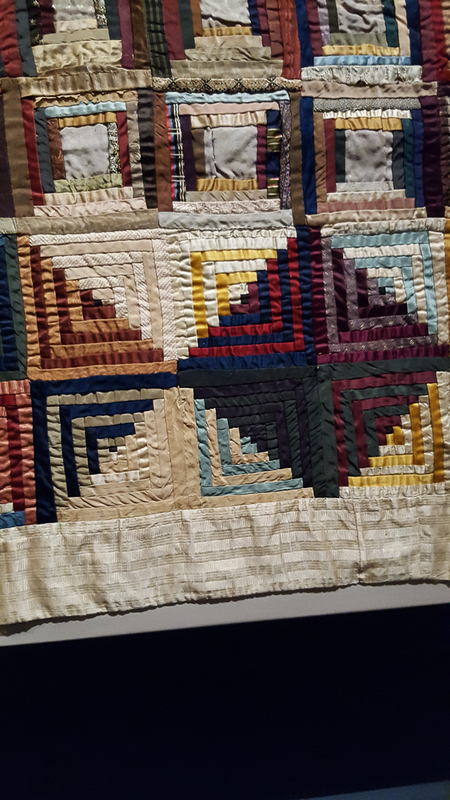 I found it super fascinating and also got to demonstrate some good quilt-nerd facts to my date. 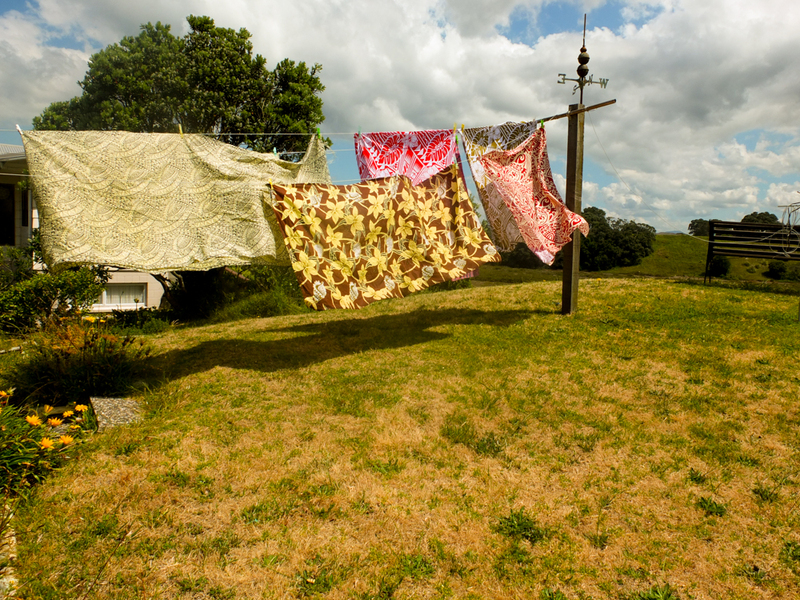 I was particularly enamored with the Wagga quilts and some of the silk log cabins. 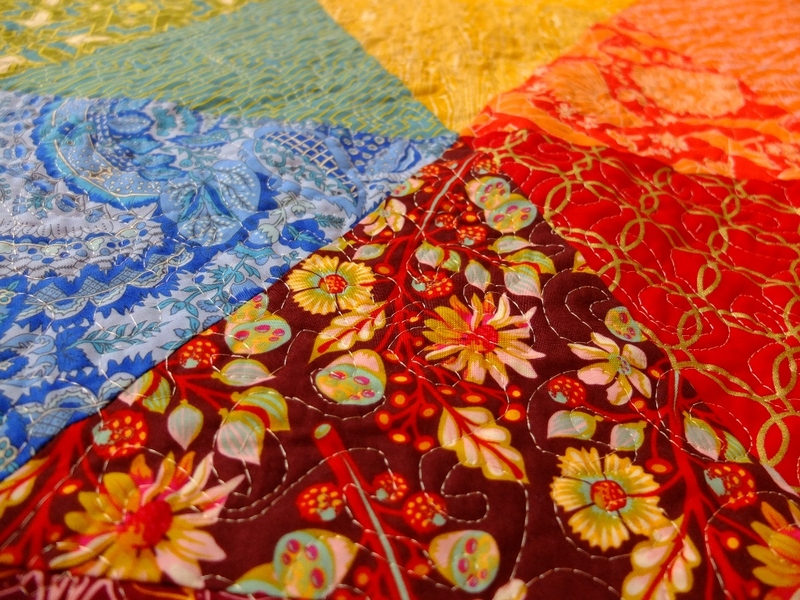 As per usual, I found the crazy quilts boring and hideous, but I can respect the skill that goes into them. 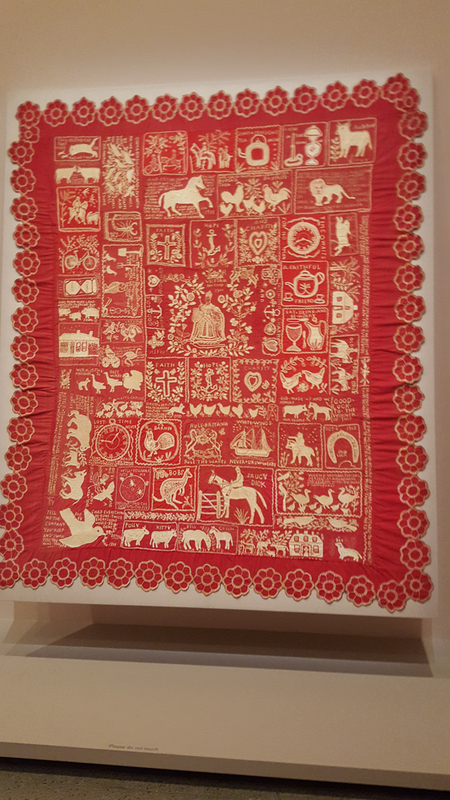 I also really loved this red and white quilt which was made as a prize in a raffle? So much advice stitched into one item! A gorgeous friend of mine, Robbie, is always immaculately dressed and because he is both generous and extremely well put together he allowed me to take a look at one of his (I think) most excellent pieces with the express purpose of purloining a small bit of his style for myself. 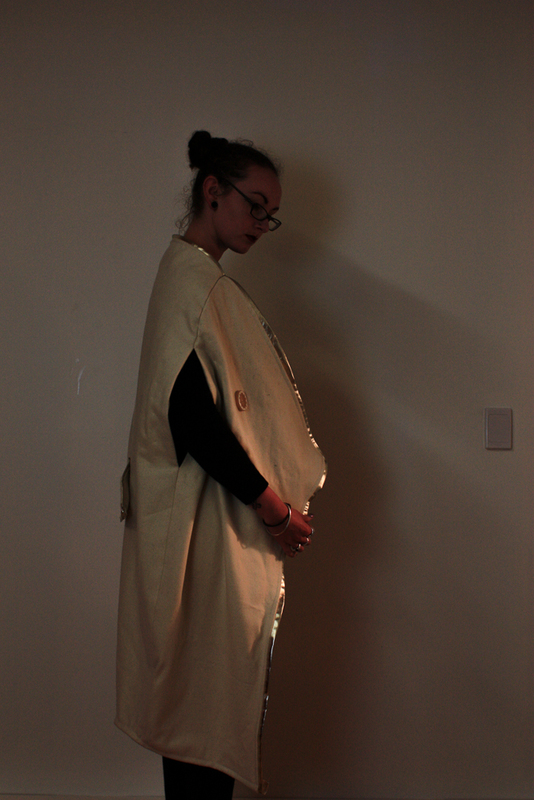 It’s a beautiful draped woollen cloak which he found in a second hand store in Tauranga and it’s precisely the kind of gender-neutral drapery I have been lusting after for some time now. 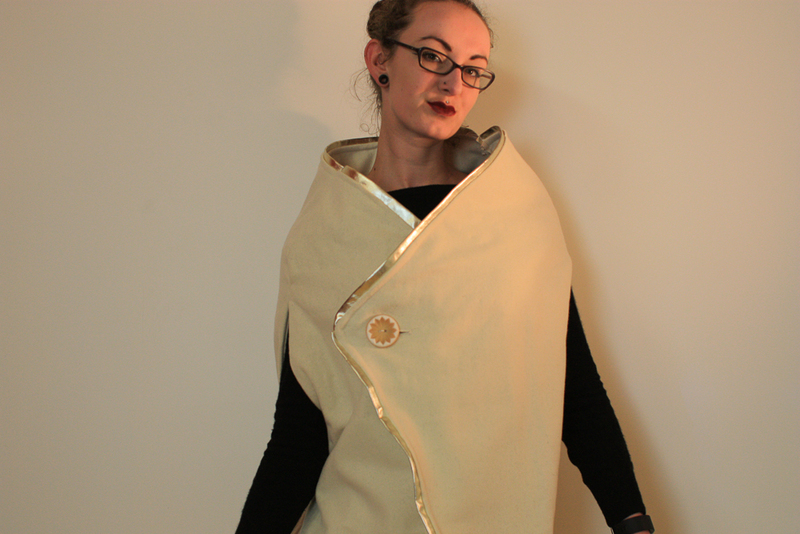 Taking inspiration from that I made some changes to make the design my own, including using a knit fabric so it would have a little more body and bounce to it and making it quite a lot longer because I have a fondness for dramatic swooping and set to work. 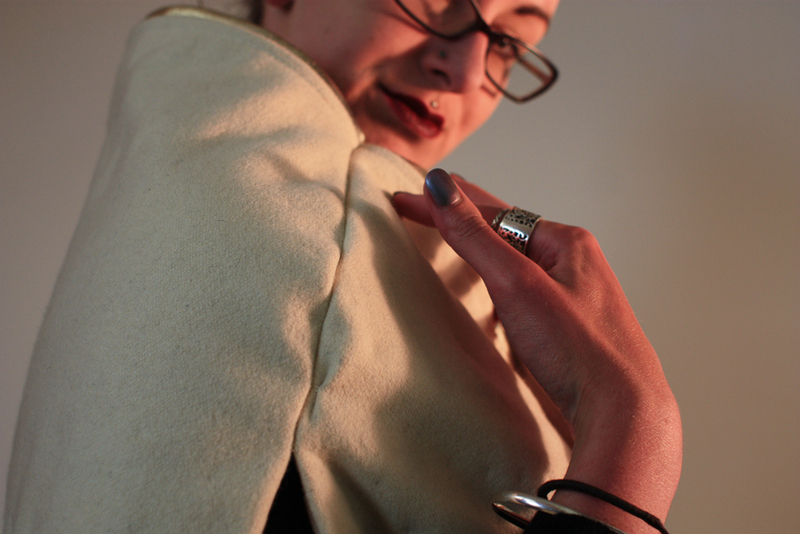 I picked up heavy 100% Merino from The Fabric Store who are lovely and also about 10 minutes from my studio (convenient) and then, buoyed by my own successes in making a cape-cloak which I can also use to take a nap in naturally set to work taking selfies. Anyway, I apparently underestimated the degree to which my pals (particularly on Twitter) also need an outfit for dramatic swooping and impromptu naps because this has far and away been my most successful selfie yet – I’ve had three orders come through. 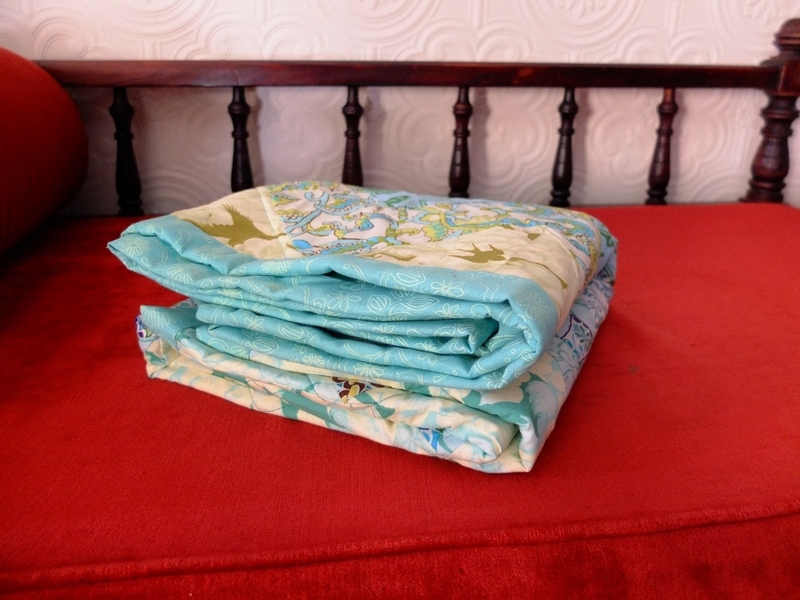 I look forward to making the look du jour for Wellington an elegant nap blankie, and with that in mind popped a listing up on Etsy right here if you would like one for yourself. 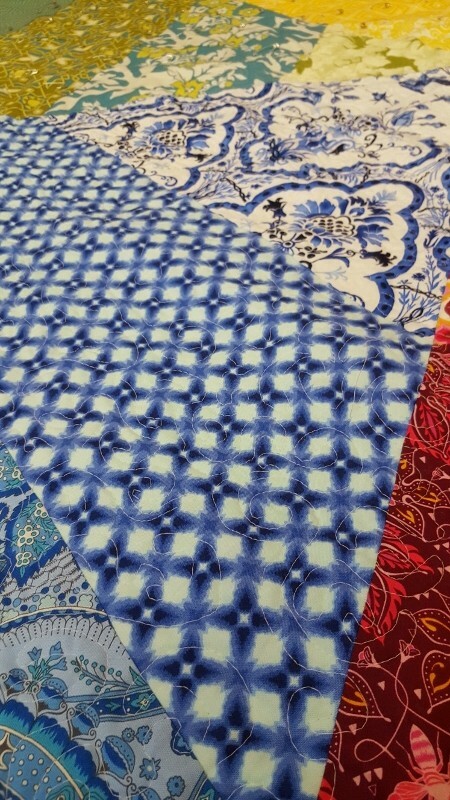 Other things I’ve been up to in the last few weeks include attending the Australasian Quilt Convention in Melbourne last week. This is the second year I’ve gone and sadly I didn’t have time to take quite as many photos as I would have liked this time around, but I did pick up some useful bits and pieces. 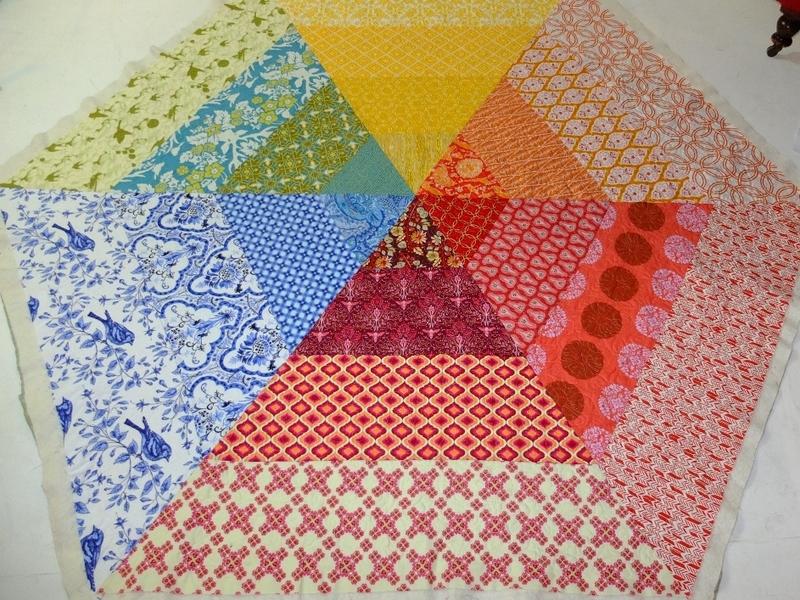 I’m making a commissioned single bed size quilt in blues, blacks and whites and grabbed some nice fat quarters for that. I also grabbed a rotating cutting board which I’m very excited about for squaring up blocks. While trying to be lazy/speedy the other day I ran over my knuckle with a rotary cutter because I was trying to cut sideways, so hopefully I can avoid more sewing injuries now I have it. I also took a quick look around the exhibition side of things and was very taken with this (it has a rainbow gradient in it, I know you’re all shocked.) 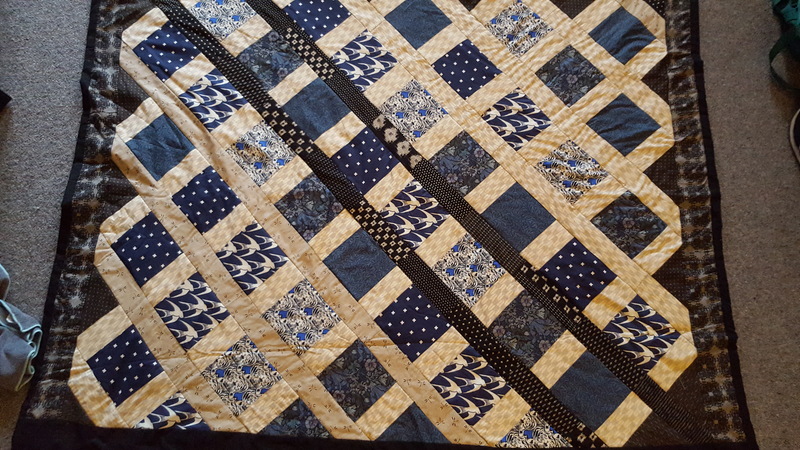 It’s called Dear Angela, made by Phil Thomas and is hand pieced and hand quilted. I do have to say, since it would be kind of remiss not to mention this, that I would really appreciate it if the AQC declined to let exhibitors/vendors sell Golliwogs at the show. As far as I could see it was just one table, but boy they really went all out in terms of every possible textile craft in which one might want to make a super-racist children’s toy. I kind of can’t believe this is still seen as a remotely? Acceptable? Thing? in 2016 but apparently the AQC didn’t think it was worth mentioning. Quilting in general seems to skew very white and towards an older demographic, which I think is a great shame, particularly given the histories of quilting within non-white cultures and communities (and in fairness there were some great vendors selling fabrics from Japan at the show, including Wabi-Sabi Designs so it’s not like this was completely missing from the convention) . But y’know, maybe the community as a whole would be a bit more welcoming and open if the first thing you see upon entering a convention wasn’t a whole table full of racist caricatures. I have two (2) things to show off today! 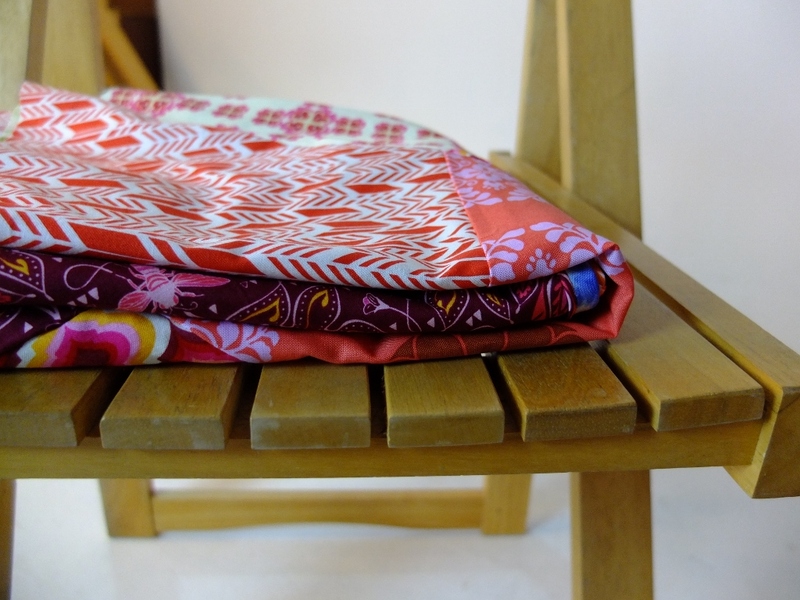 The first is a quilt which I made as a birthday gift for someone very dear to me. 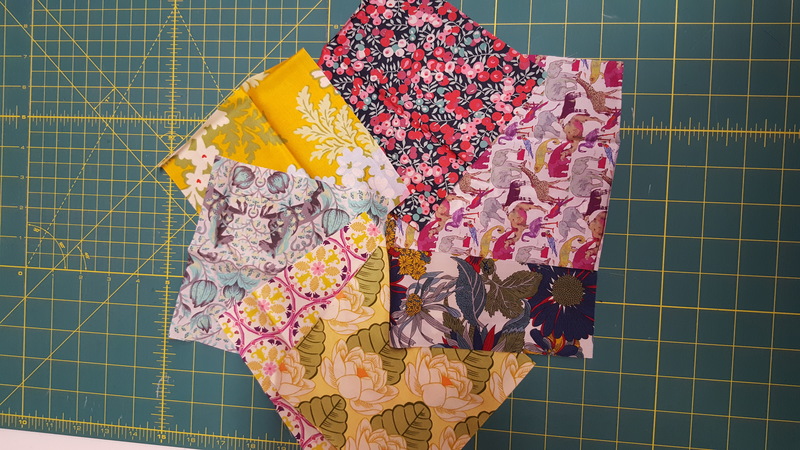 It’s my first experiment with English paper piecing, as well as the first quilt which is (sort of, I guess) a wholecloth quilt. 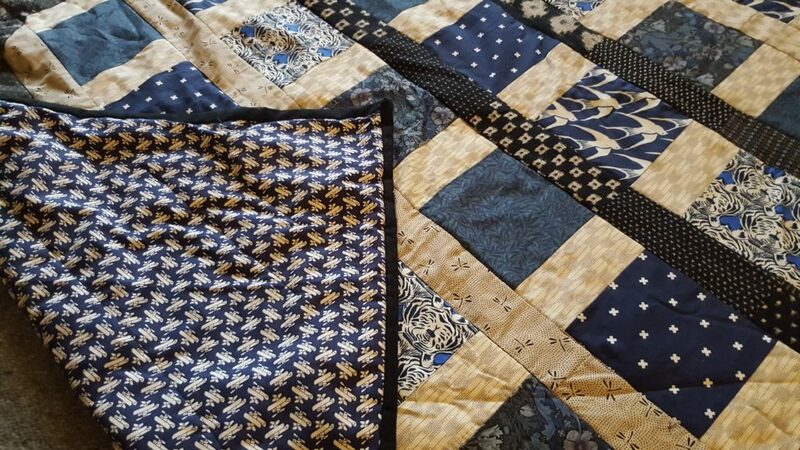 I’ve been fascinated by wholecloth quilts for ages now, and it might be something I experiment with more later this year. I’m keen to try out multiple layers of imagery in them in subtly different thread colours, because why would I start with something straightforward? That would be the easy way out. But anyway, a few more progress pictures. 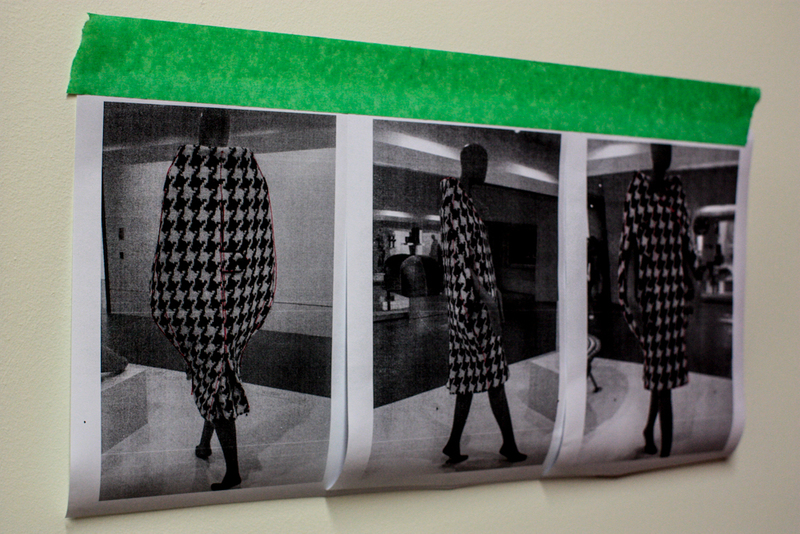 I should also mention that the design was inspired by some of the quilts I’ve seen Modern Handcrafts make. 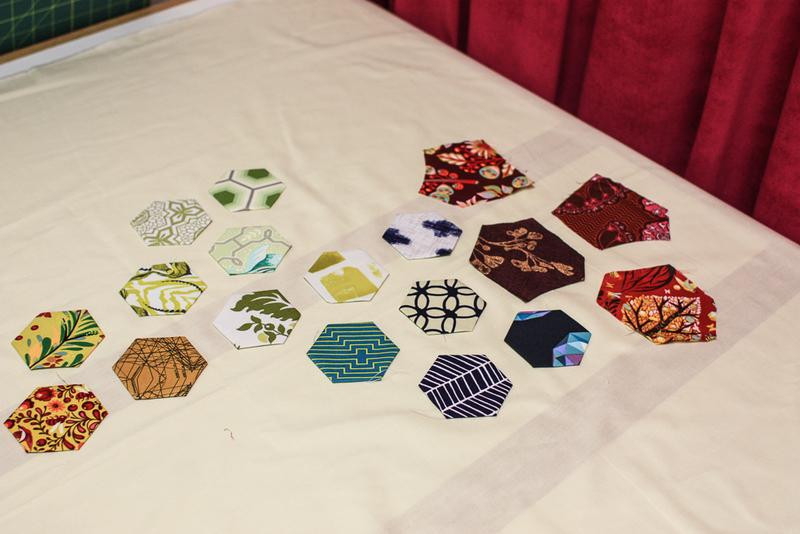 Arranging the hexagons and deciding on my fabric choices. 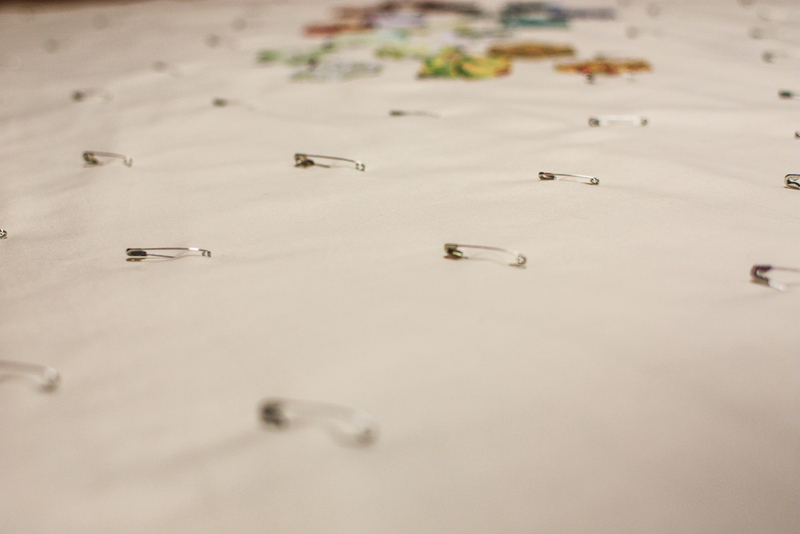 I sort of love how all the tiny safety pins look spread across the quilt – like a school of fish. 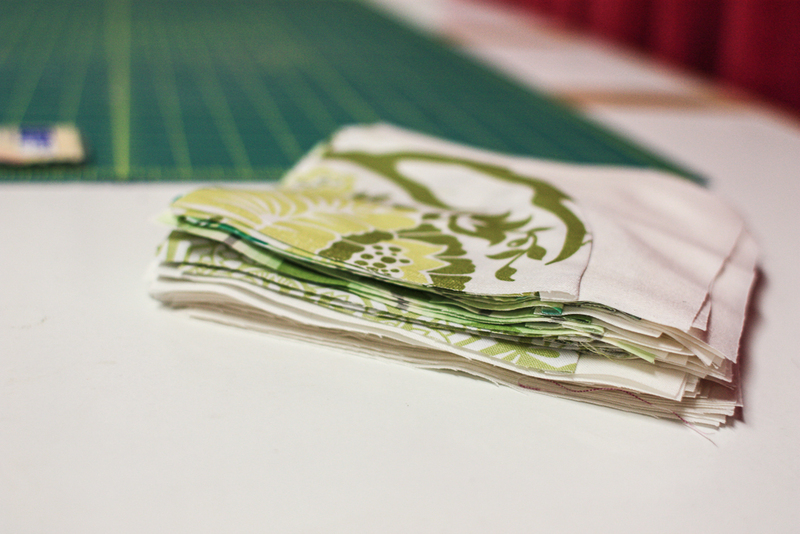 I think this might be as far as I go with paper-piecing. 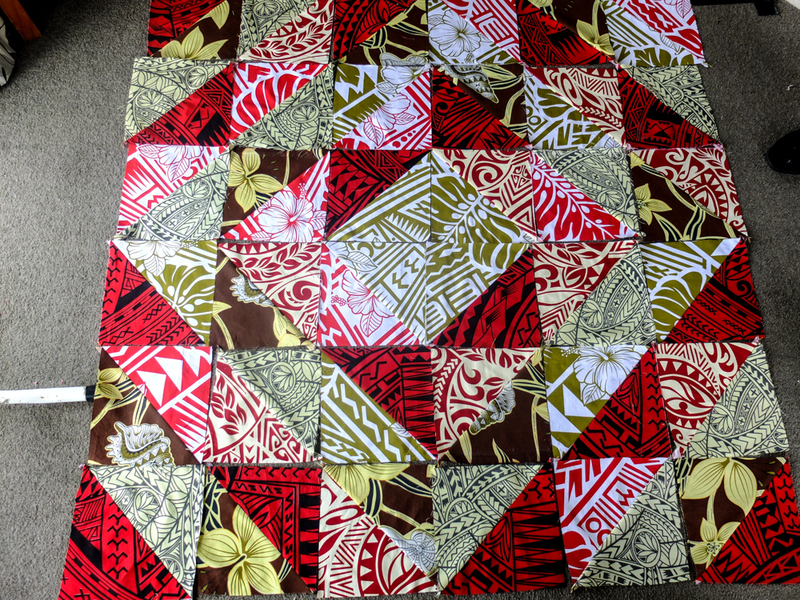 I’m still chipping away at the (very small) paper pieced block for the Sleigher quilt I started, uh, a year and a half ago. 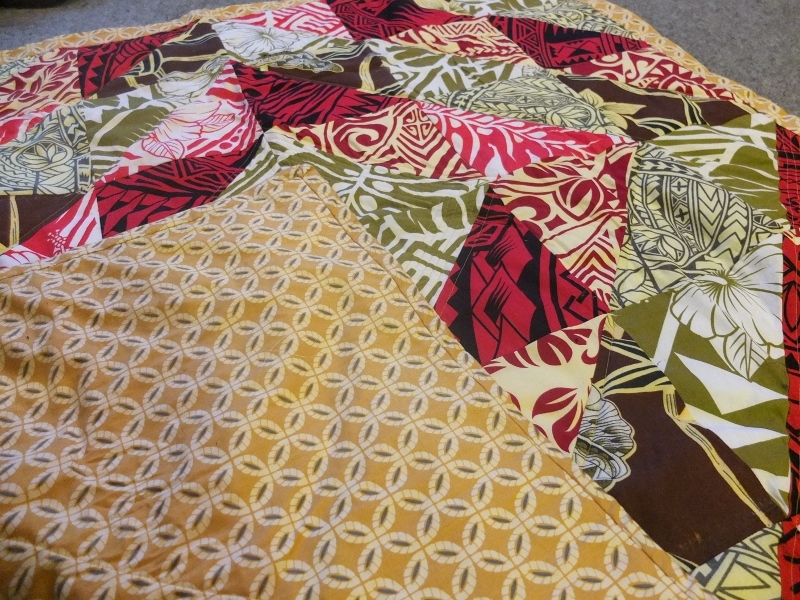 I love the lightness of this quilt though and the quilted lines were also my first experiment with using a disappearing fabric marker. 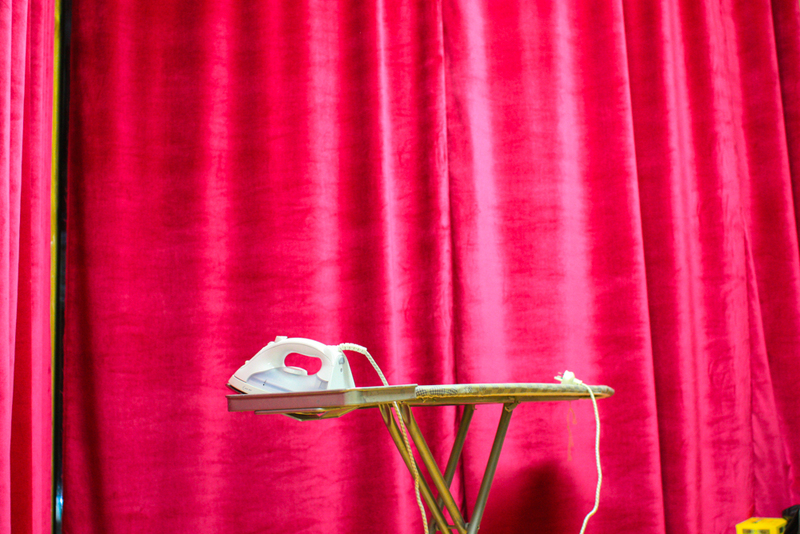 It worker surprisingly well and has me thinking about whole cloth projects with more seriousness. 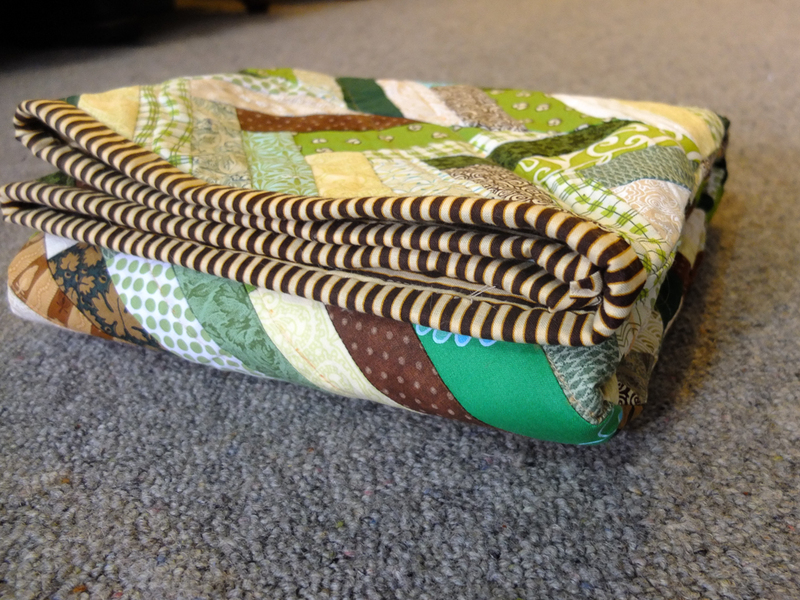 And the finished quilt, with a black and gold binding. 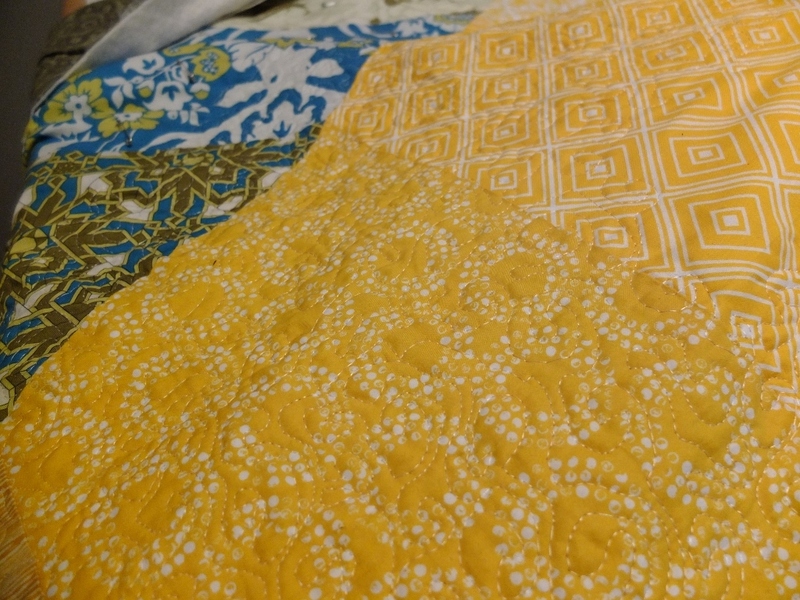 The other thing I’ve been making fast progress with has been the nesting quilt I showed some early progress on in my last post. I’ve around 2/3 of the way through sewing the initial four block portions, I think perhaps another few hours and the whole top should be complete. 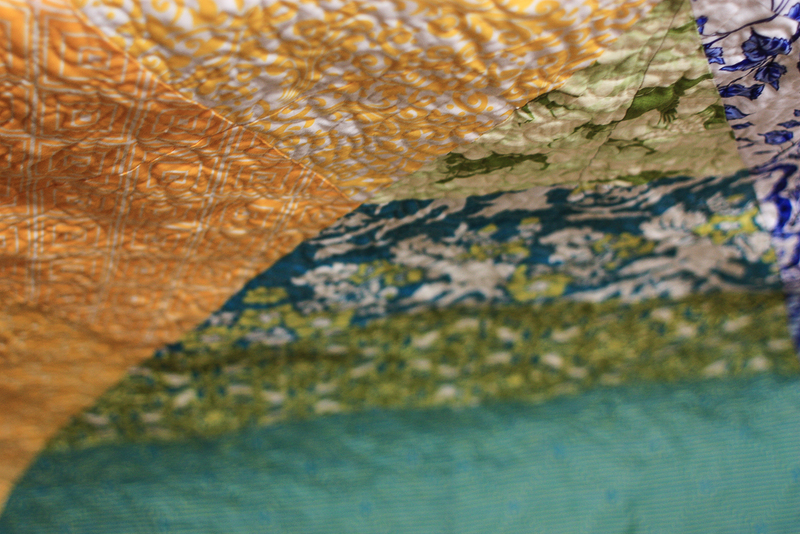 I like naming my quilts, and I’m still tossing around potential names for this series (this is 1 of 7). 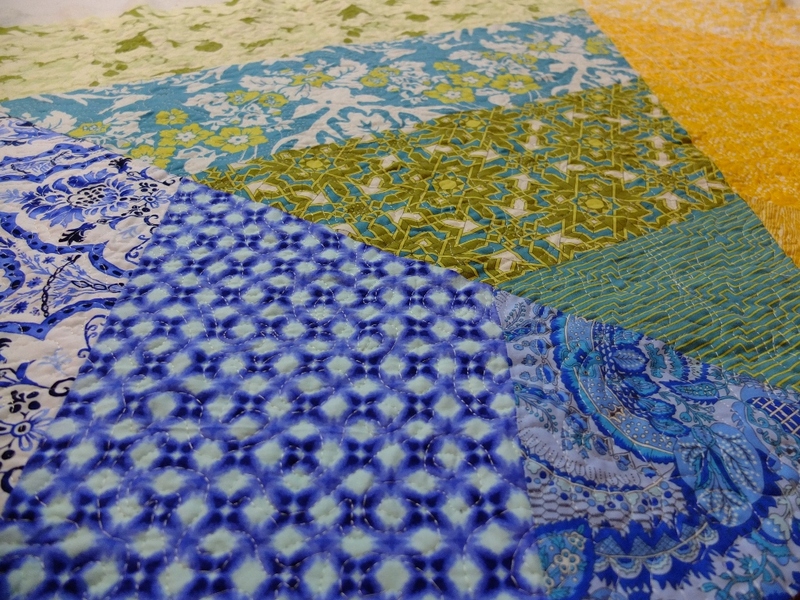 Part of me wants some kind of play on the ever smaller quilts, or something to do with the repetition and inversion of form and colour that will be apparent through the whole series. 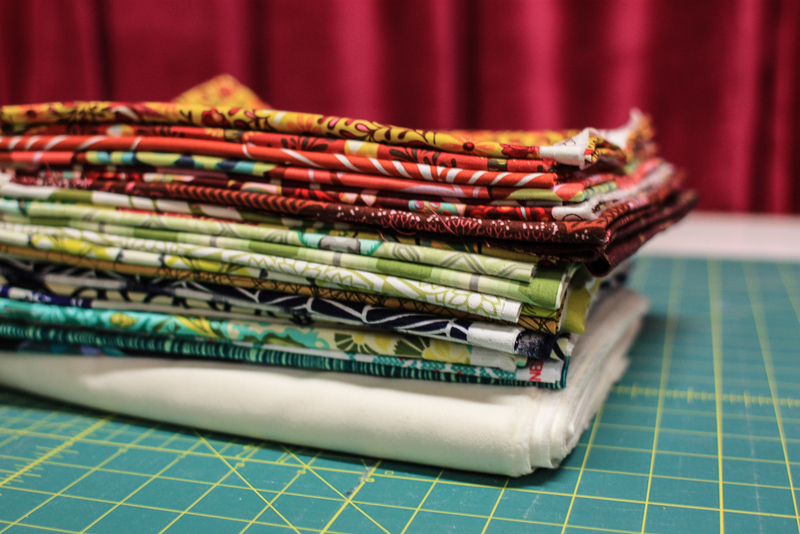 Dwindling pile of single blocks. The other development is that I finally got shelves for my studio! 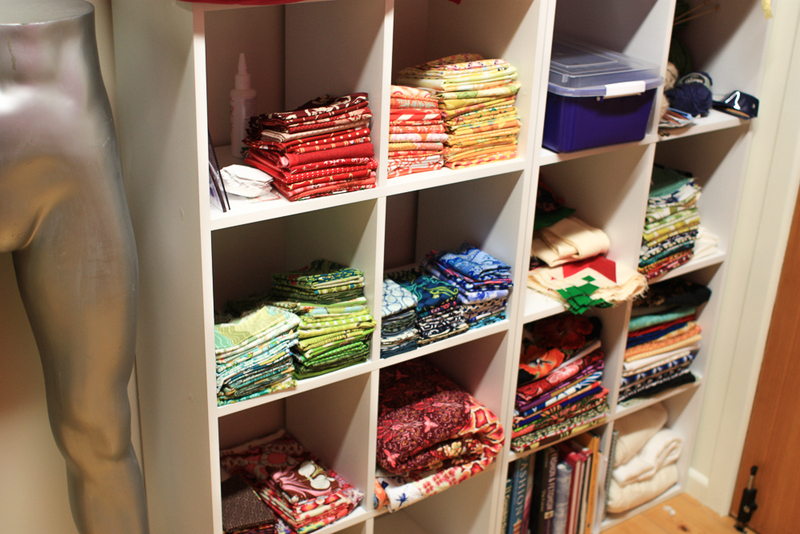 No more storing everything in a pile of plastic containers inching ever closer to my workbench. 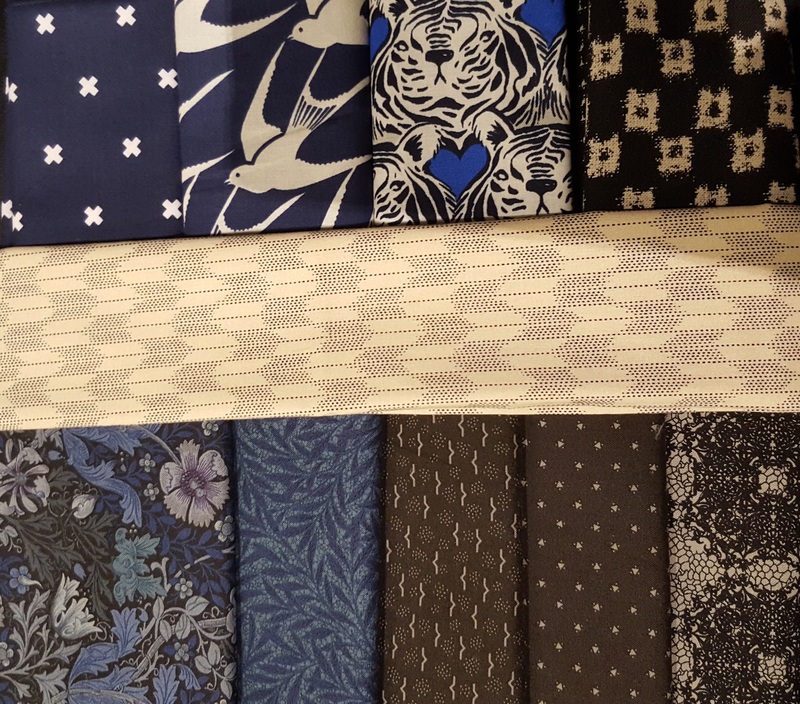 Left is all my fabric arrayed by colour, right is lengths suitable for backing or binding and a separate cube for each WiP. So, for the better part of the last two years almost everything I’ve made has been chevrons. Different colours and sizes, sure, but chevrons as far as the eye can see. 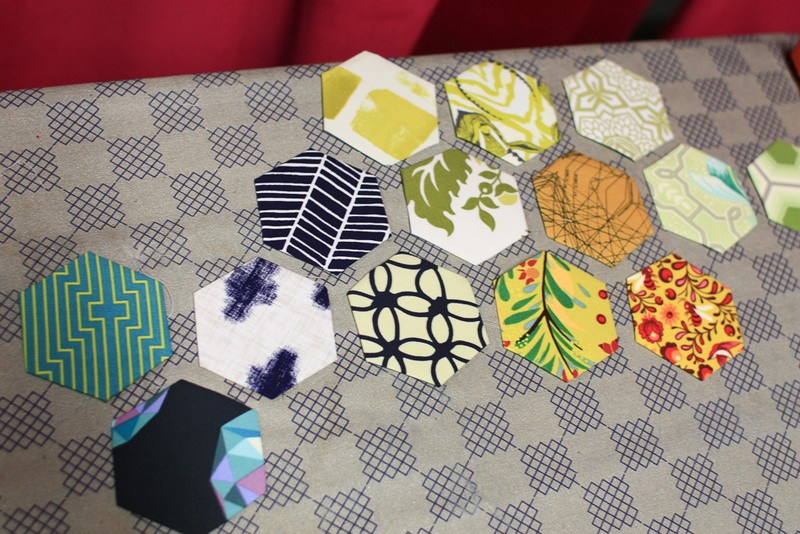 It looks like 2015-16’s look du annual will be hexagons. 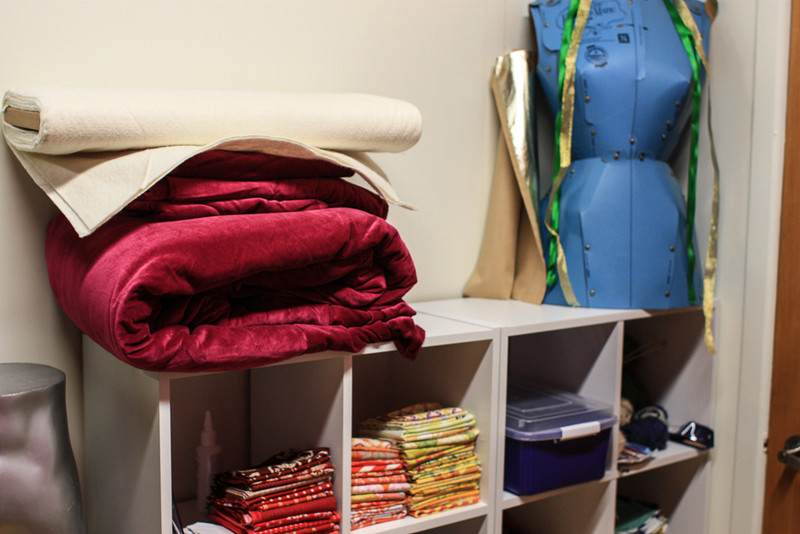 All the free motion quilting done, awkwardly piled over my worktable for trimming before the binding. 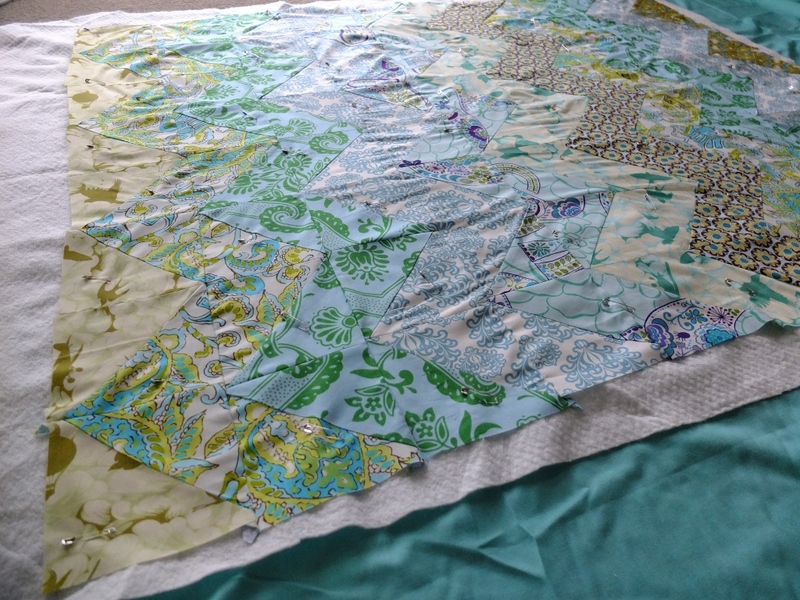 So far so good – although there was one casualty of this quilt (aside from my knees and wrists.) My poor little Brother BM-2600 gave up the ghost in a sad fashion part way through the free motion quilting. After probably an hour and a half of running it solidly at top speed it made a very sad noise, slowed to a crawl and started to smell lightly of overheating electrics. I ran it into the ground (I suspect I burned out the motor.) I bought a replacement from the same point in Brother’s line: the GS2510. 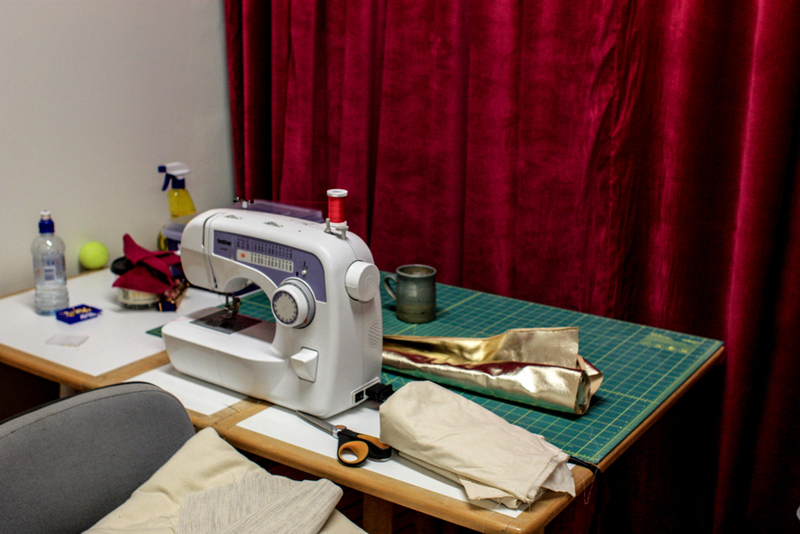 I’ve heard some people have issues with the longevity of Brother machines, but honestly I’ve never had an issue with their entry level mechanical ones: I used the 2600 for eight years and probably sewed on it for an average of 10-15 hours a week. I should confess I never took it for a proper service, figuring if it blew a gasket in a spectacular fashion I could just afford to spring for a new one and instead just aimed a can of compressed air at the bobbin-zone once in a while. All things considered, given it cost me something like $250 when I bought it I think I got a good deal of life out of it. 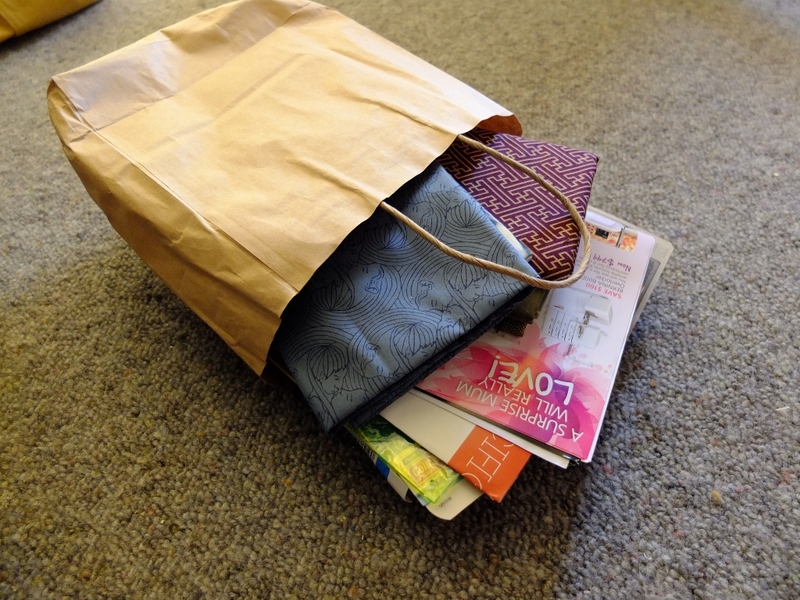 I also had a lovely haul arrive from Hawthorne Threads. 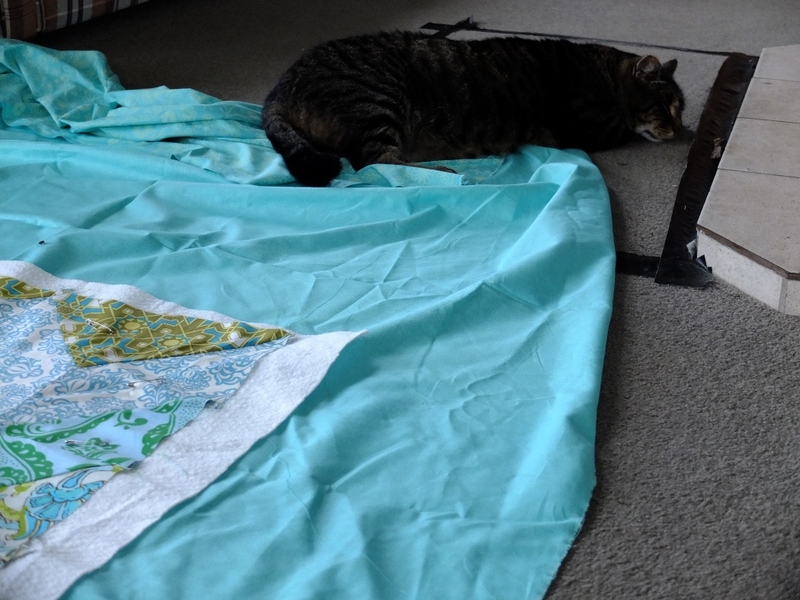 My plan for this is a drunkards path quilt, which should measure about 185cm x 185cm when complete. 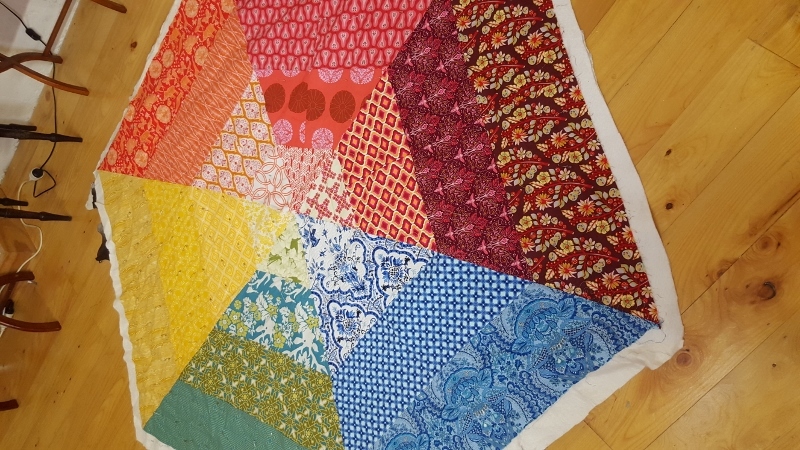 However, when you trim the white L-shapes for this quilt you’re left with a bunch of smaller quarter circles, which seem to suggest they ought to be in a complementary quilt which is slightly smaller. 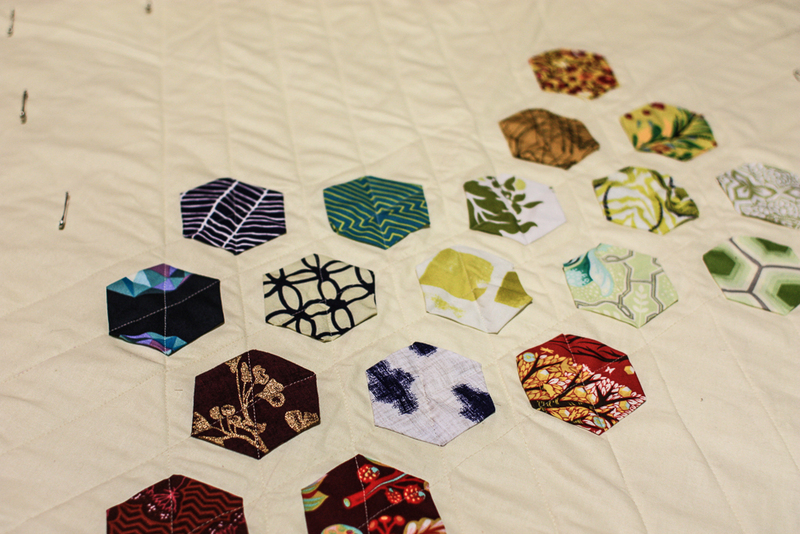 And then of course, you’d trim the L shapes for THAT quilt and be left with slightly smaller again quarter circles. 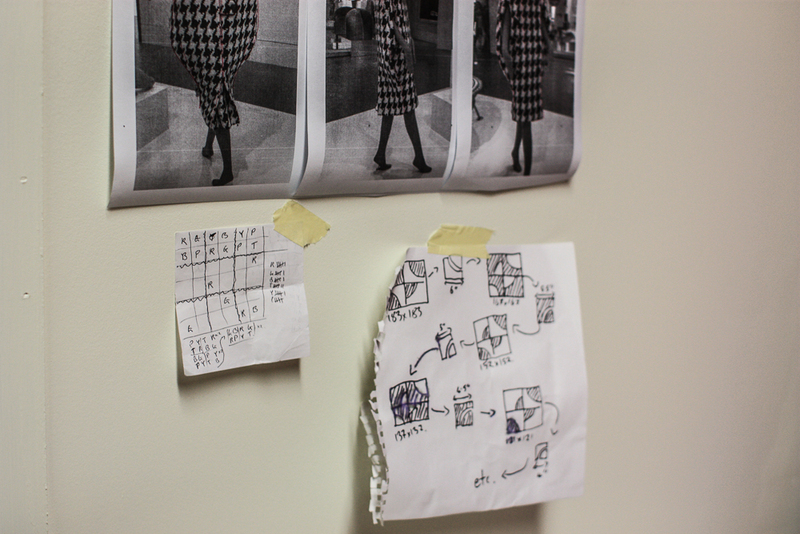 Needless to say I took to my high tech design wall. Expect some delightful smaller and smaller drunkards paths until I get sick of following this weird little rabbit hole. 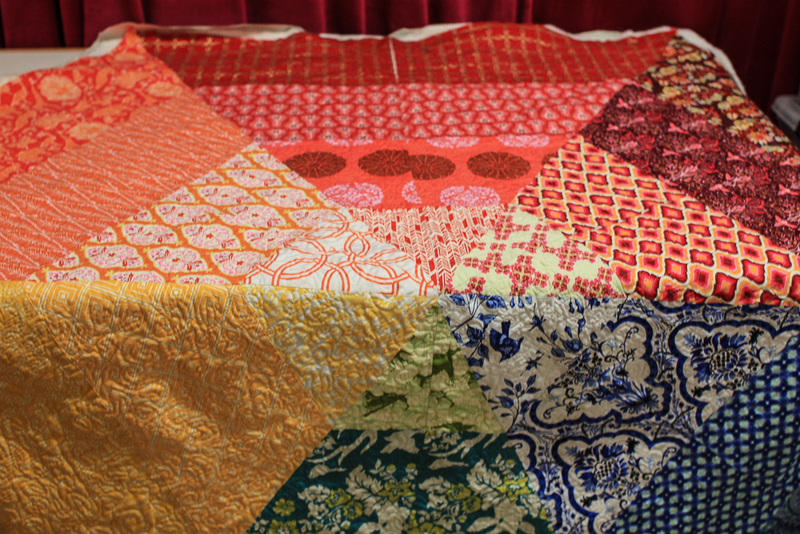 I find the idea of recursive quilts echoing back and forth very very satisfying. Something about the New Year is making me want to finish what I’ve started before I begin anything new. 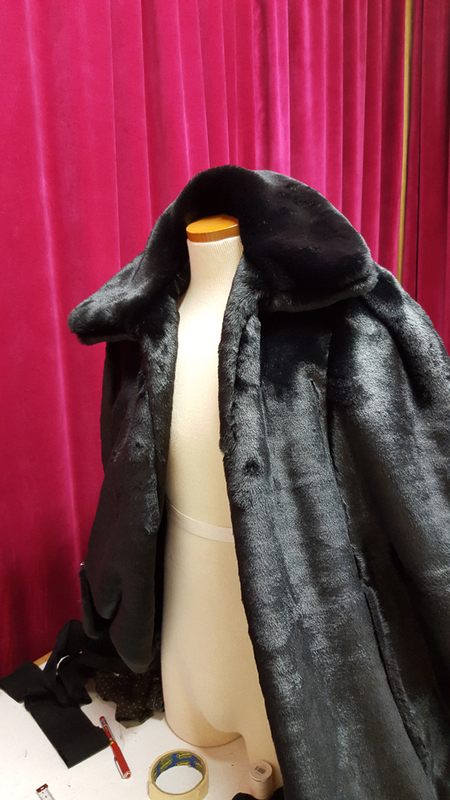 In my last post I showed off the coat I’ve finally finished after some eight months – today I have two more finishes, and one WiP I’m making good progress on. First! 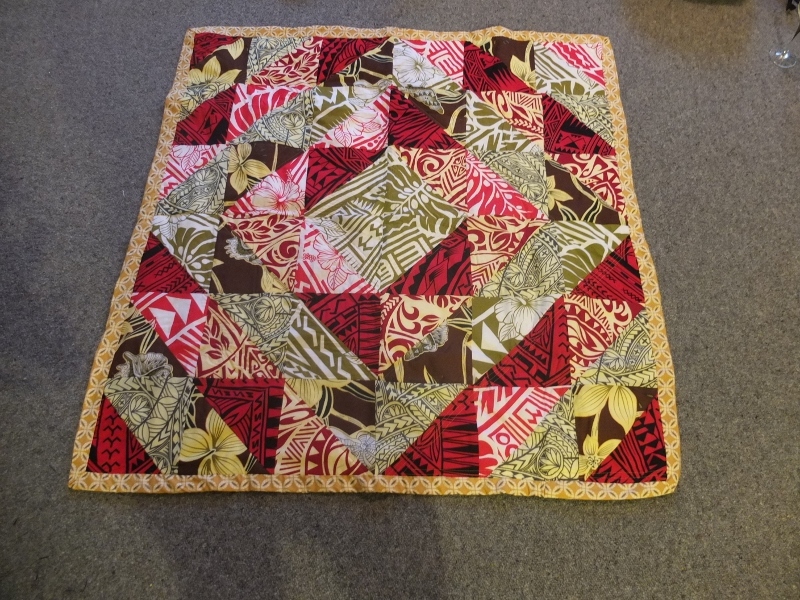 The baby quilt I finished just before Christmas. I recently located the photos I took and then immediately lost among my extensive library of memory cards. 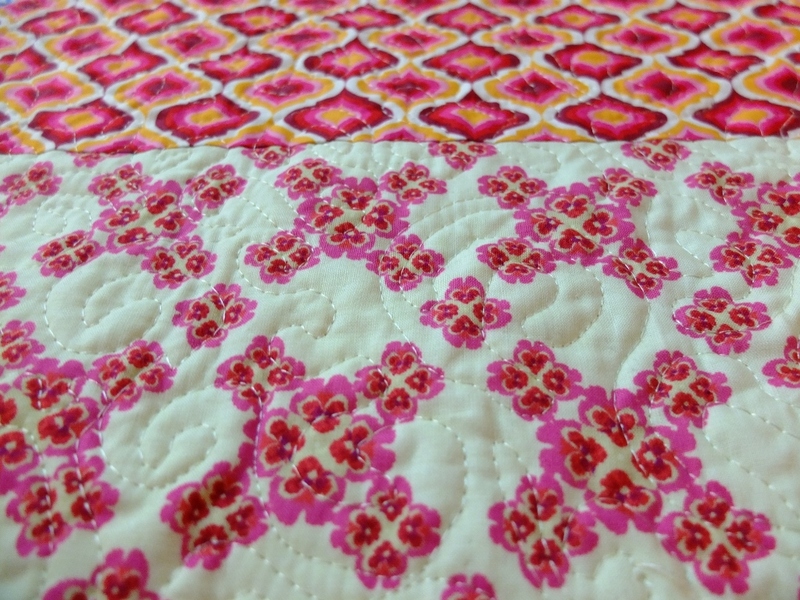 I love it: it’s soft and lightly quilted and just right for a snuggly floor quilt for a baby. 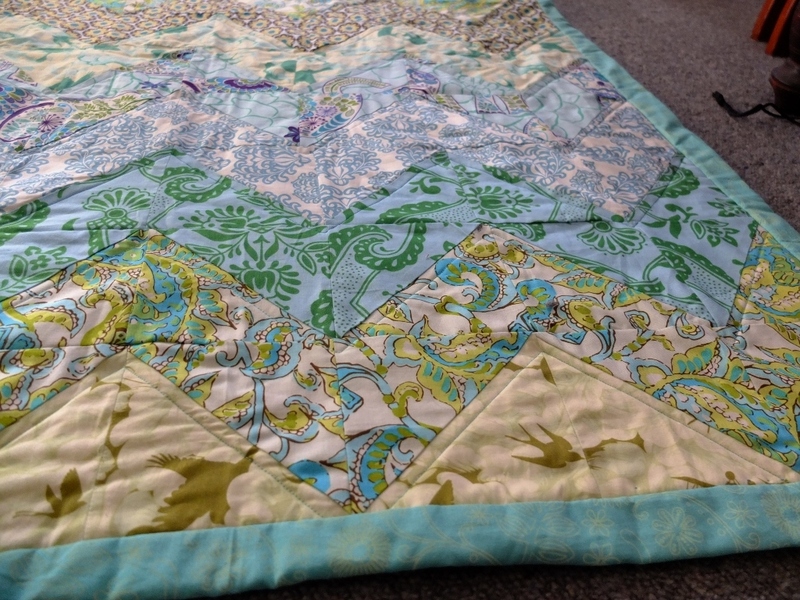 Next up: I finished the French Braid quilt I started about four years ago. Finished! Done! 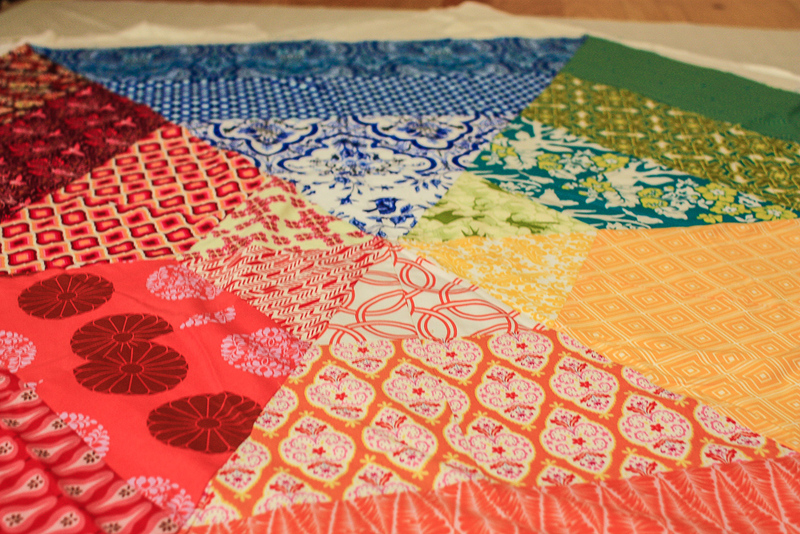 (Also now listed on my Etsy) The odd thing about working on a quilt for this long is how much my tastes have changed. 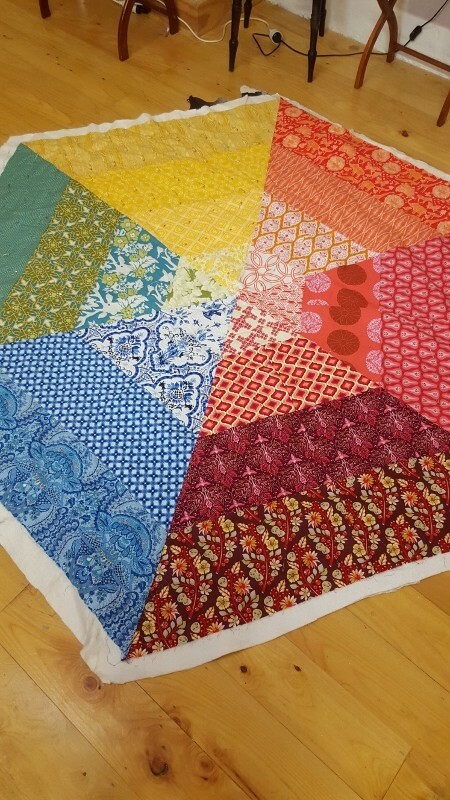 I still like this quilt, but I can’t imagine I’d do anything with such a deliberate lack of intention or form to the colour arrangements? 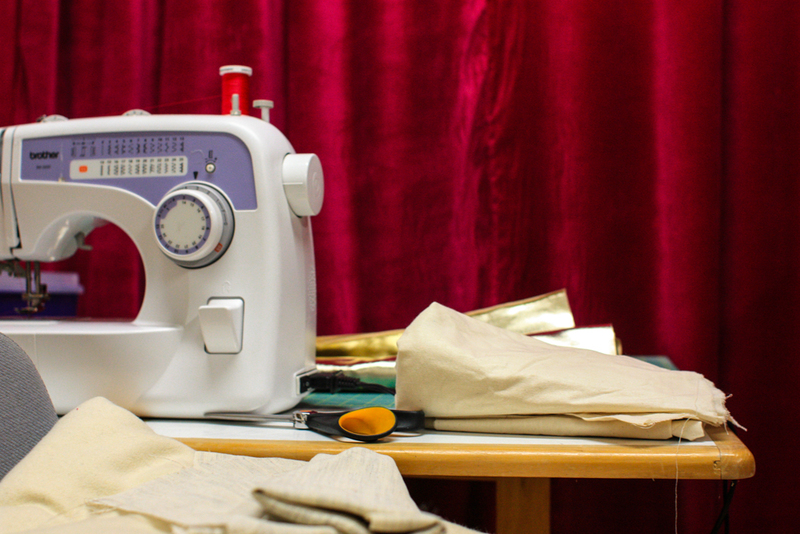 I find that I much prefer sewing with a strong sense of purpose and a clearly defined outcome now. 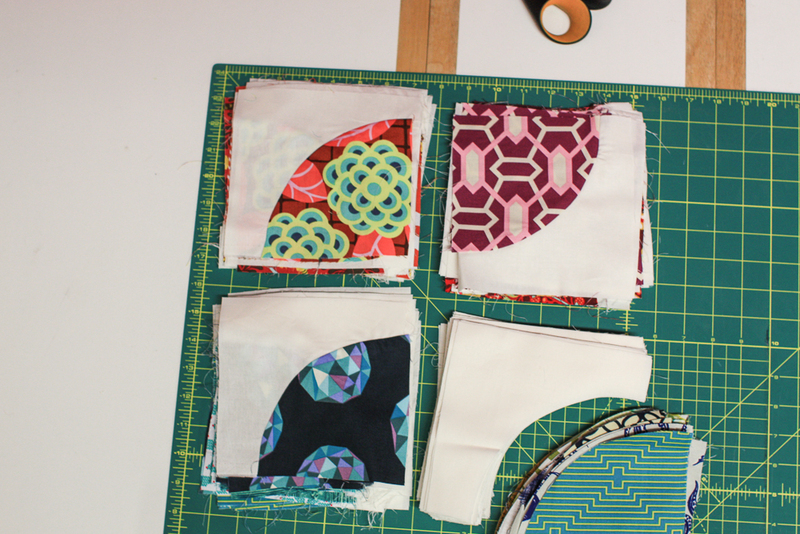 With this though I cut the strips for the chevrons (chevrons are one thing that hasn’t changed in my quilting) and then pulled them out more or less at random to sew together the blocks. 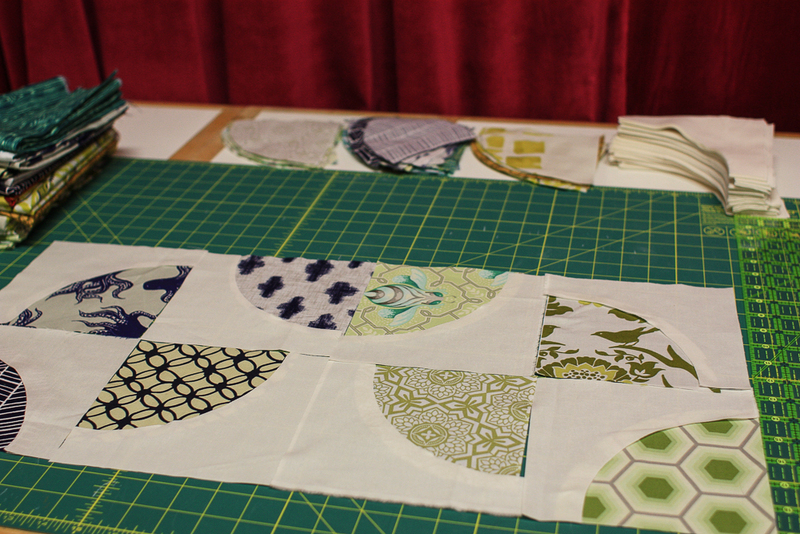 This next one is the early stages of quilting together a top I’ve had sitting aside since last May. 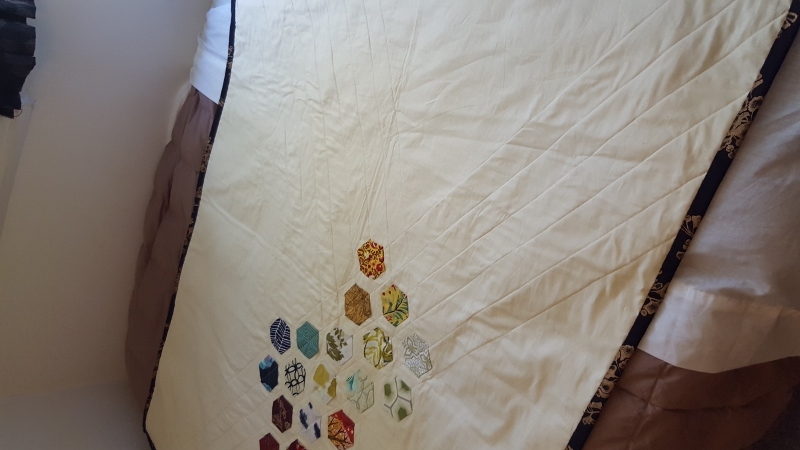 It’s the twin to the hexagon quilt I made last year: where that one went from a high density center to low density colour at the edges this does the opposite: I used the leftovers from the original to sew it. 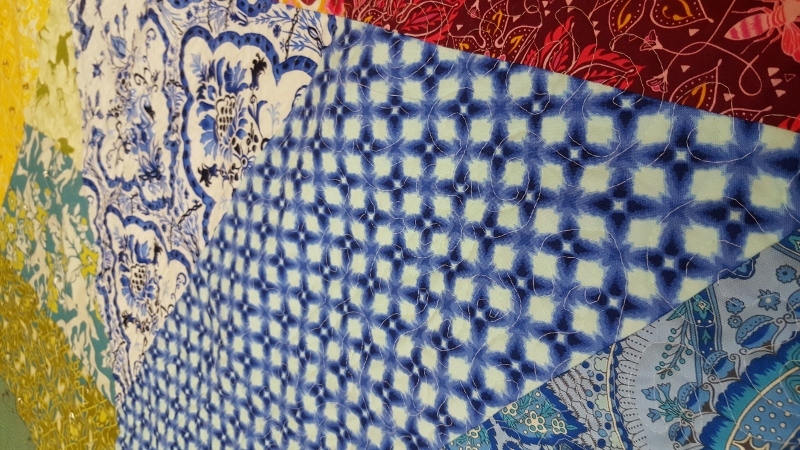 I’m doing a free motion quilting, same as before, but this time in a regular Gutermann thread, instead of the Sulky thread. 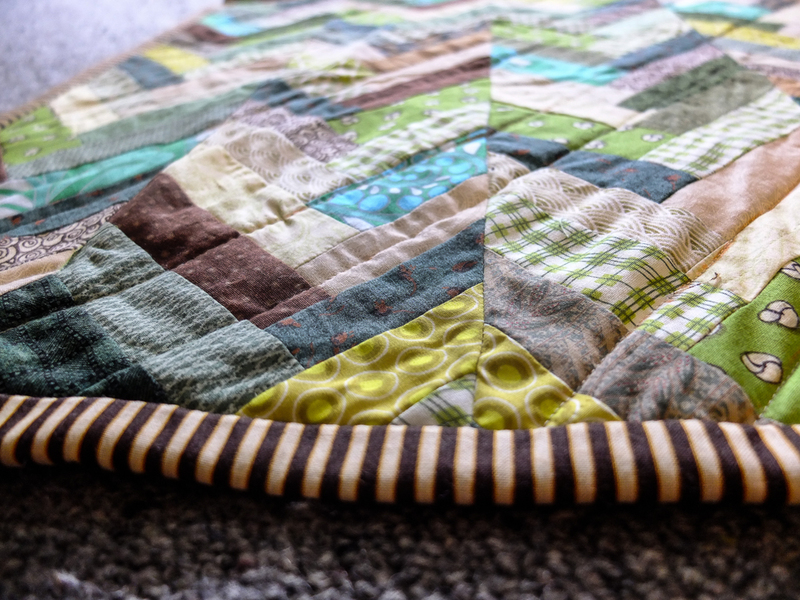 Sulky thread gives an amazing finish and looks beautiful, but also broke anytime I changed speeds even slightly while quilting, meaning I had to rethread my machine about every 5-10 minutes through the whole 7+ hours of quilting. 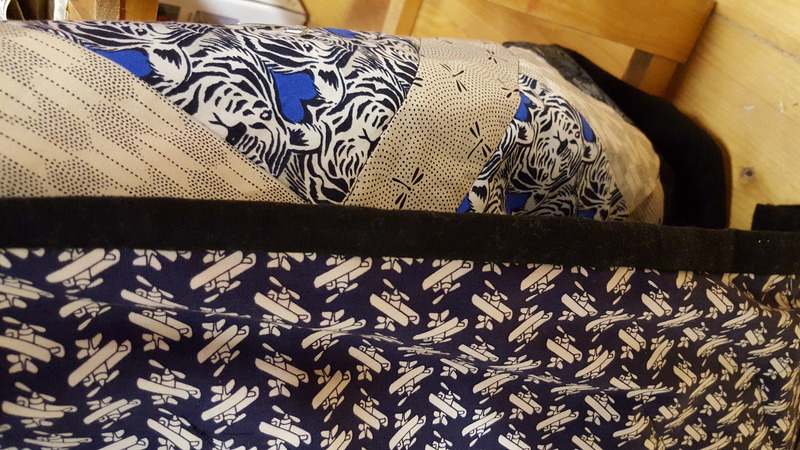 The patterns not being completely matched is annoying me slightly, I have to admit but it was the most efficient way to use the leftover fabric. I’ve quilted one sixth of this so far, which took just over an hour – the combination of pulling such an enormous mass of fabric around my machine and the extra effort required for free motion quilting anyway completely annihilated my mid-back, so I might have to pace myself when it comes to finishing this off. I’m waiting on a gigantic order from Hawthorne Threads too, but I’ve told myself I’m not allowed to cut into it until I finished up this hexagon. I’m looking for the perfect 6″ drunkards path template set too, which is a tougher thing than you might think (I suspect I’m going to go for the Marti Mitchell templates) so I can’t cut into it until that arrives anyway. I’m excited to post my next project once it is underway though! 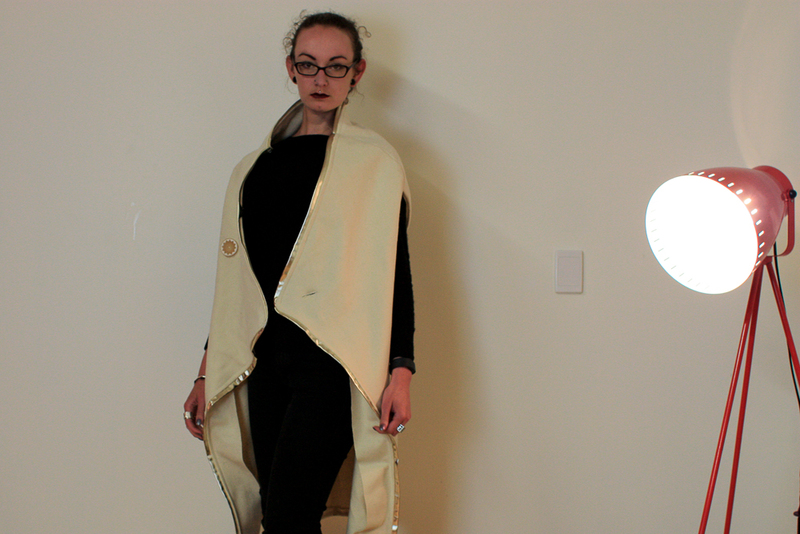 The coat I showed some progress on over the last few months is finally finished! 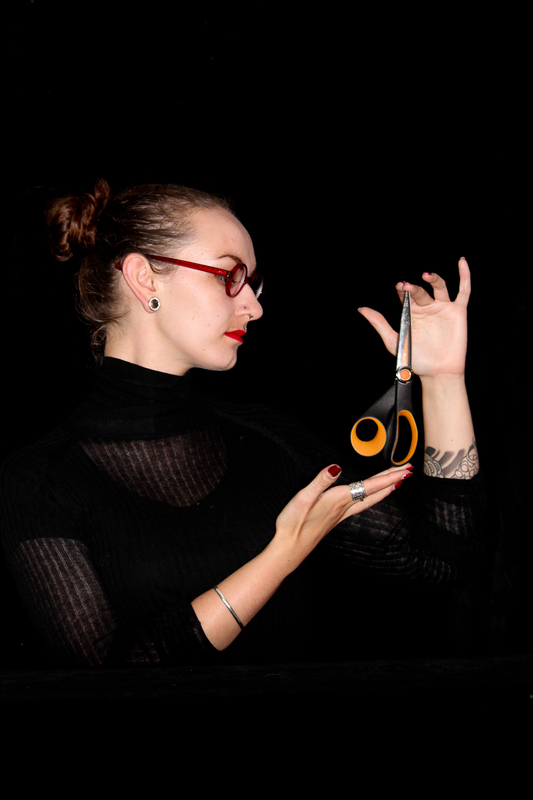 I created it with the intention of it being kind of sculptural, cocoon like and not necessarily conforming to the shape of my body. Clothing as armour or exoskelton I suppose. 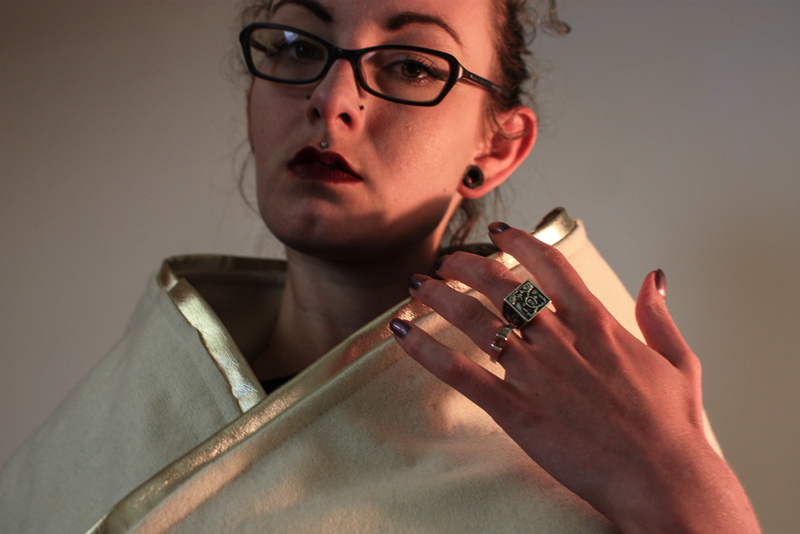 In the end I actually found this worked nicely as a flowing coat/cape too though. And the ridiculously high collar/neckline is nice for hiding from the world. 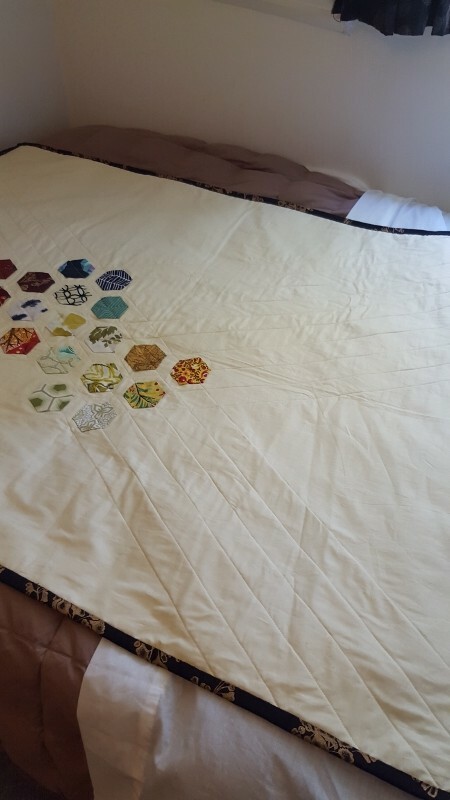 The little baby quilt I made was well received – I got an adorable snap from my friend on Christmas day of his nephew giggling away on it. 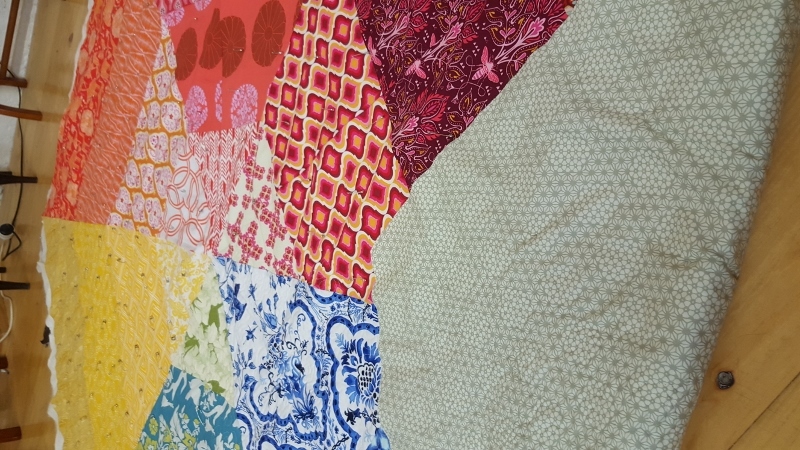 I’m contemplating buying a stack of half yards and complementary creams and whites to start work on some new large quilts too. 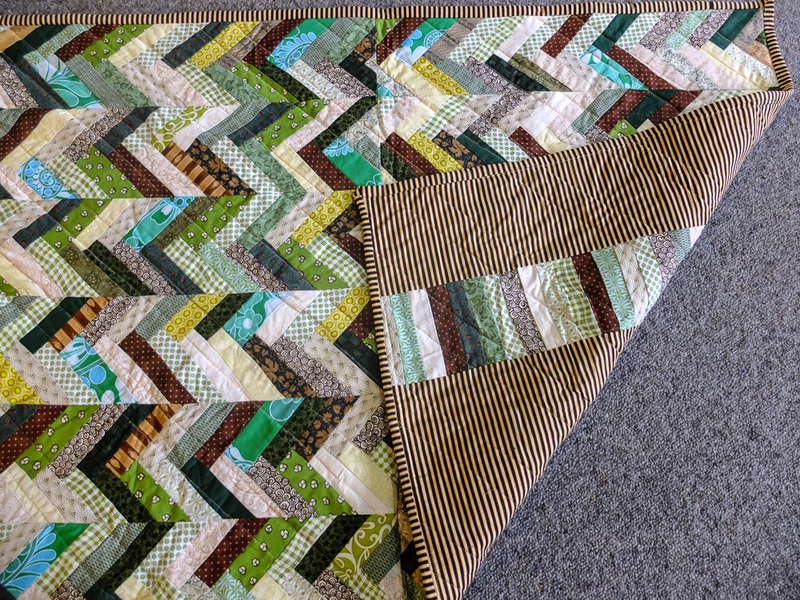 I’ve told myself I can’t begin them until I finally (finally) finish the binding on the brown and green chevron quilt that’s been quietly waiting in my lounge for six months and done the quilting on the inverse twin of the hexagon rainbow gradient quilt I made last May. I just caught up on my backlog of reading from December and reading through some of my favourite blog’s 2015 recaps has been a pleasure. 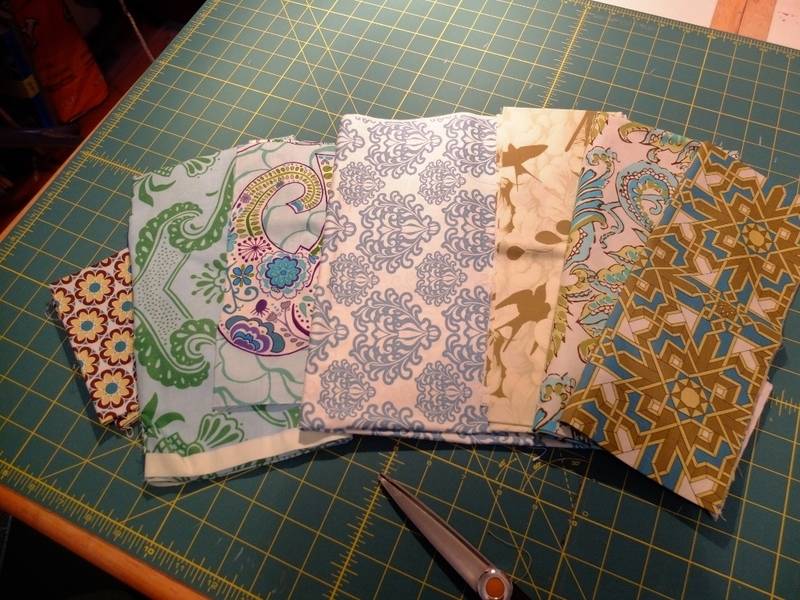 One particular highlight was this post from Jaybird Quilts. 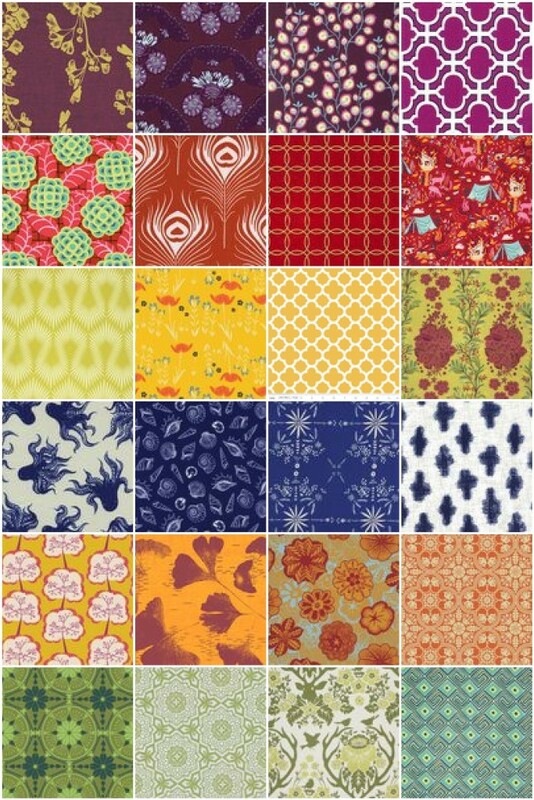 I love rainbow fabrics, I love colour gradients, I love jewel tones and chevrons and seeing her photos was like having some deep part of my psyche massaged. I feel as though everyone I know is out at a Christmas Party – meanwhile, I’m having my own Christmas celebration, including catching up on a long overdue post. First things first. My new studio space! 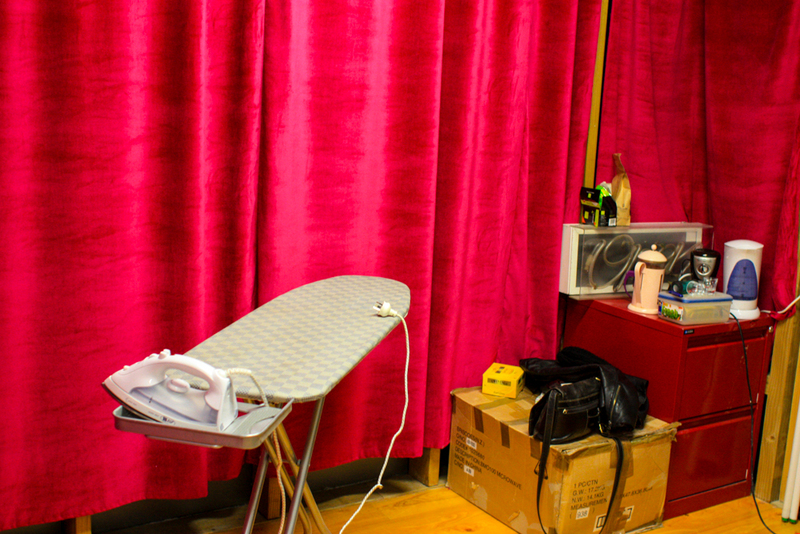 I moved in and sewed some luxe-as-hell pink velvet curtains. 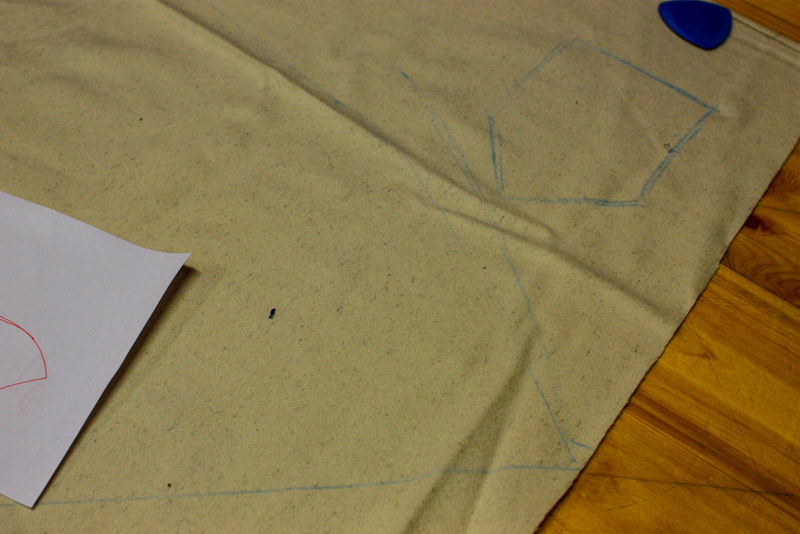 In typical me-fashion I basically sketched the pattern onto the fabric and started cutting. 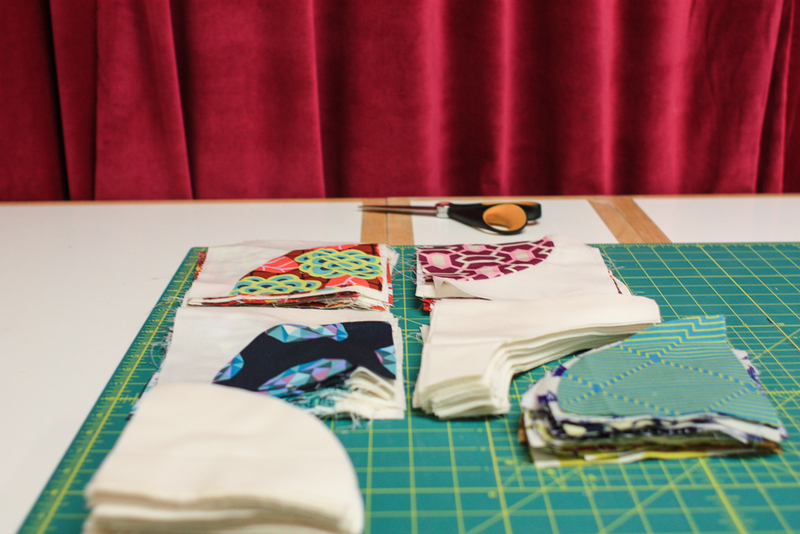 The tea cup and tennis ball are crucial parts of the sewing process. (If you roll around on a tennis ball for 5-10 minutes your mid-back might forgive you for kneeling on a wooden floor for an hour.) I’m still working on the coat, but this week I’ve been watching cheesy Christmas movies and teaching myself padstitching techniques as I shape the upper. 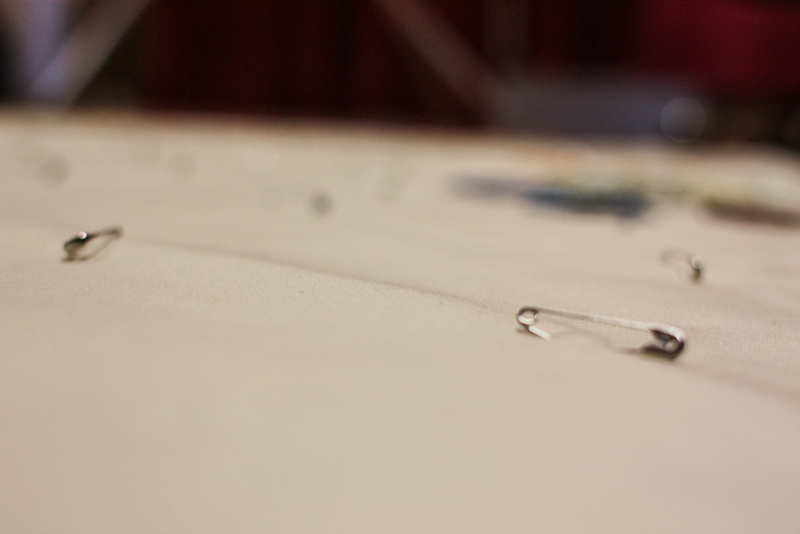 Also, here’s an in-progress shot of the button tab for the back and pinning the hair-canvas. 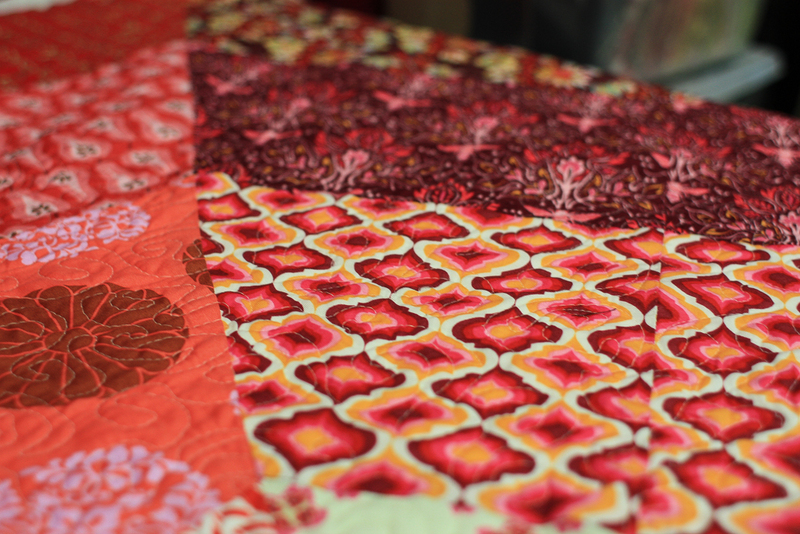 Also, I’ve started and very nearly finished a new quilt. This one has a time limit, so it’ll be done before Christmas. 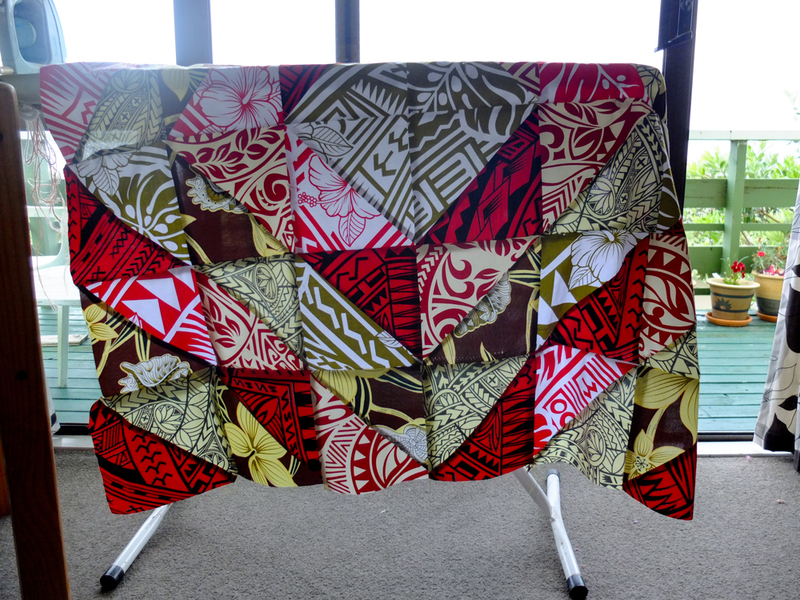 You might remember the post I made about the beautiful fabrics from Western Samoa which I felt conflicted about using. 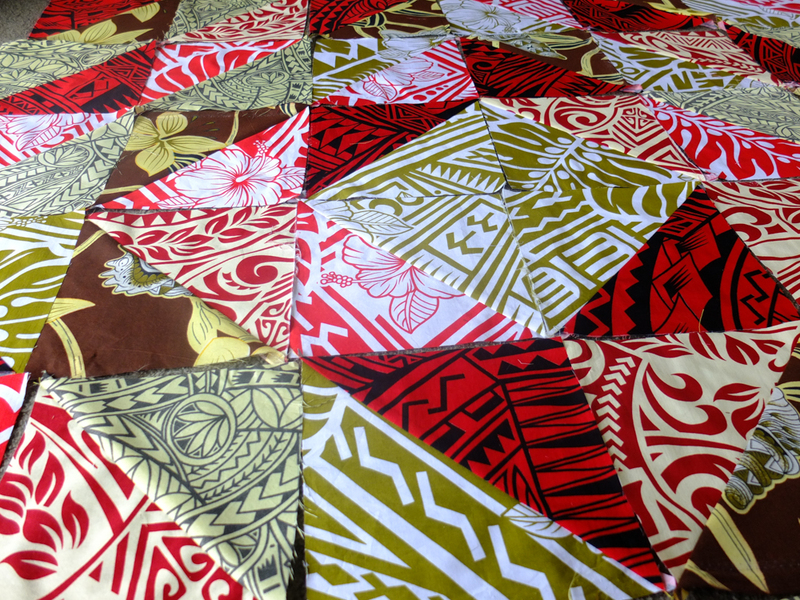 I wound up using some of them to make a quilt for a friend’s new nephew who has Samoan heritage: I felt that using them like this, in an exchange (I traded a quilt for one of his exceptionally beautiful paintings) was an appropriate way to make use of them. And backlit after sewing up. Updates pending! I’m determined to have some WIP finishes for 2015. I have a finish and an almost finish to show you all today! First up: the teal chevrons. 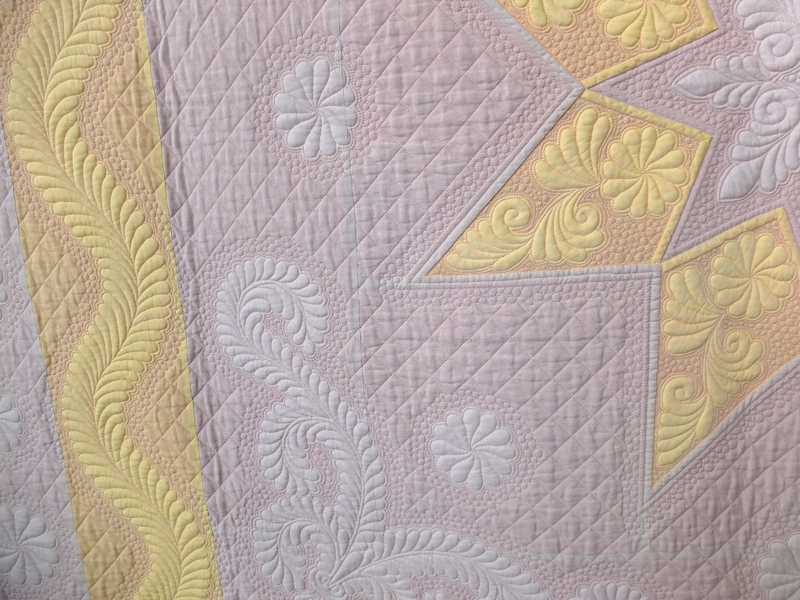 This is the wideback I chose for the backing – colours were influenced by the request of the friend commissioning the quilt. 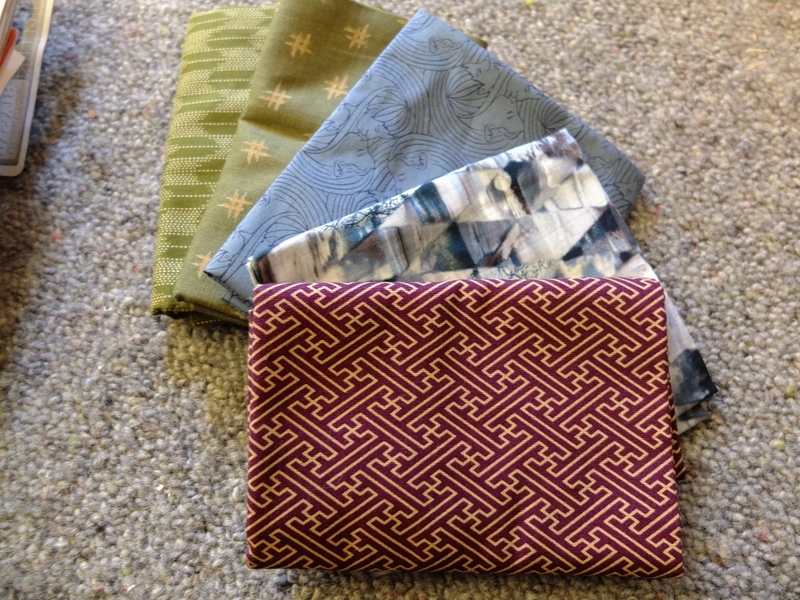 I mostly pulled the fabrics from my stash, which was exciting – nice to use what I had on hand instead of ordering and waiting impatiently for fabrics to arrive. Here’s the finished product – the recipient was extremely happy which is always gratifying. 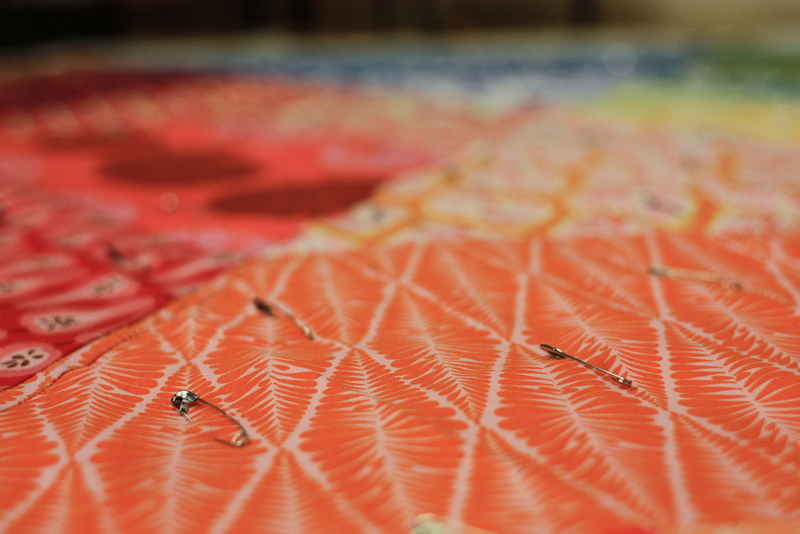 Another commission is also almost complete – I’ll be spending tomorrow sewing up the binding. 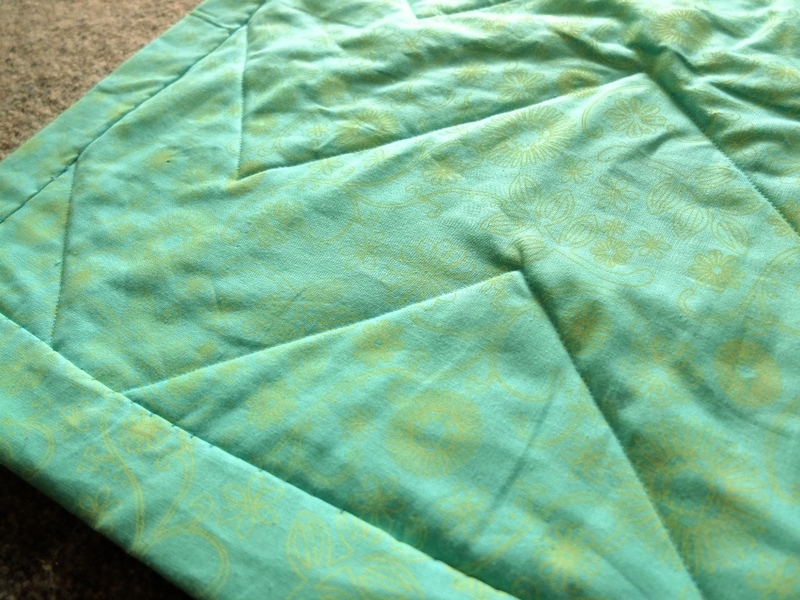 I wrangled my Brother-2600 into free motion quilting which I’m quite proud of – it doesn’t have droppable feeddogs, so I just turned the stitch length down to 0 and hoped. 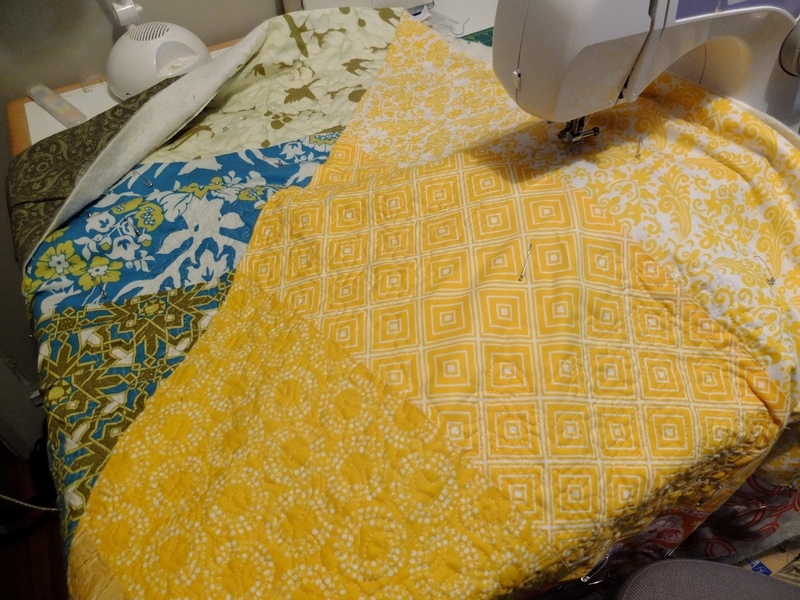 It worked very well in the end, although I need a higher quilting table because being hunched over the machine for five hours today means I spent a solid 10 minutes working the crunchier bits of my shoulders over with a tennis ball this evening. 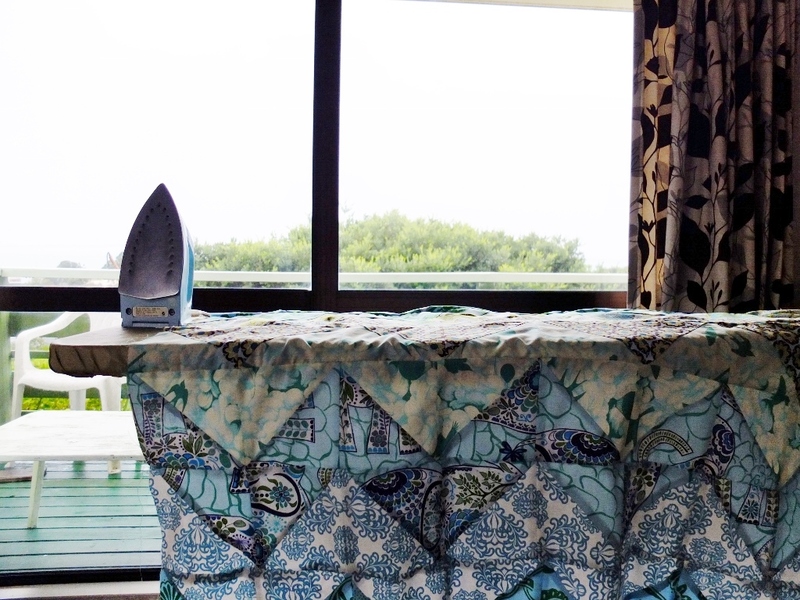 I used a Gutermann Sulky 40 weight thread for the quilting. In general I liked it – I love the shimmery barely there quality of it, and how it ties all the colours together. 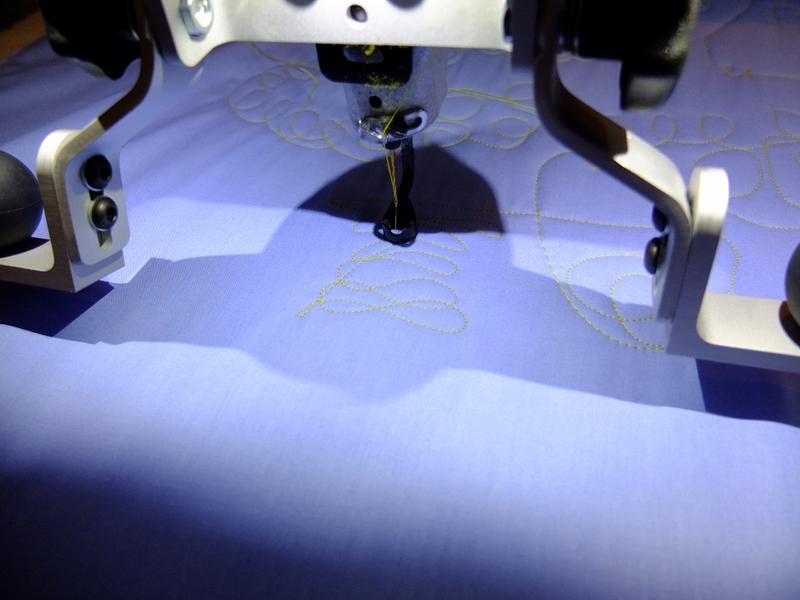 I don’t particularly love how it snaps as soon as I ramp up the speed on my machine (strangely only the top thread, not the bobbin thread) although that seemed to happen mostly in the first 30 seconds after I rethreaded the machine. I had a theory that maybe winding on a new bobbin was pulling at the thread and changing the tension, but winding the bobbins off a second reel of the same colour didn’t repair the issue, so the only solution seems to be to sew slowly. 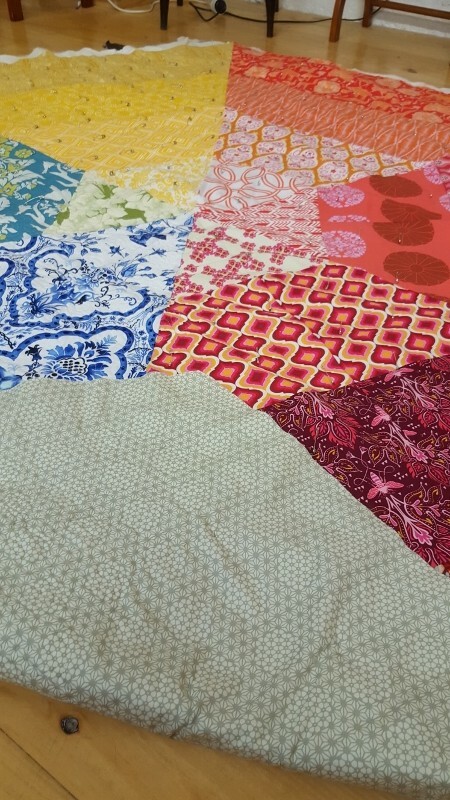 The inspiration for the colours and shape came from a shot on Instagram I saw of a colour theory talk being given at one of the major quilt conferences in the USA – someone had illustrated a colour wheel using a hexagon and immediately I was drawn to the geometrical possibilities. 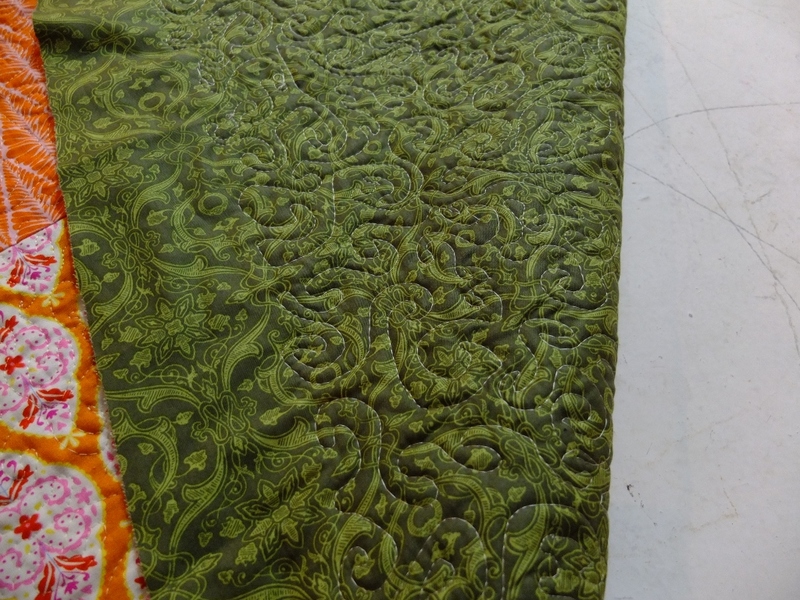 I chose a forest green for the backing fabric for this one and I’m happily back using the bamboo/cotton blend for the batting. 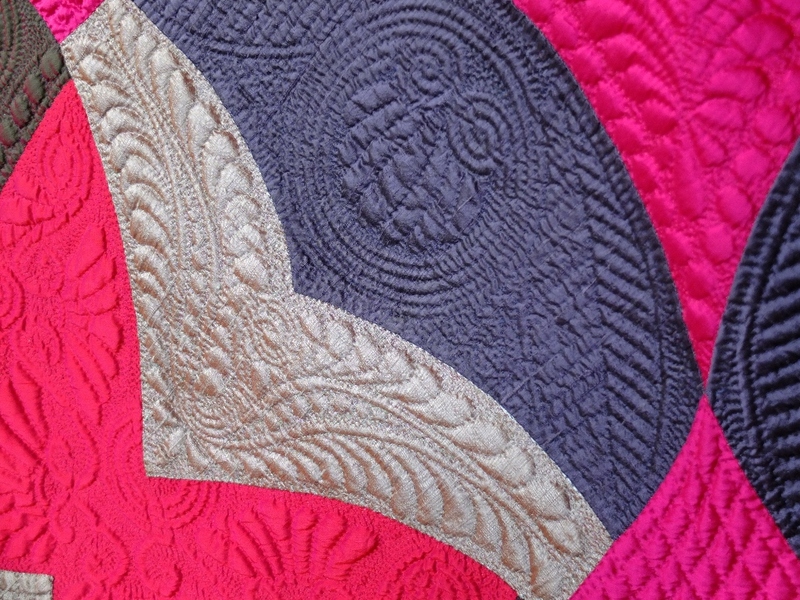 Such a dense quilting pattern has given the quilt a satisfyingly heavy hand. Well, not quite my first convention, but the first I’ve been to since I was in my teens. 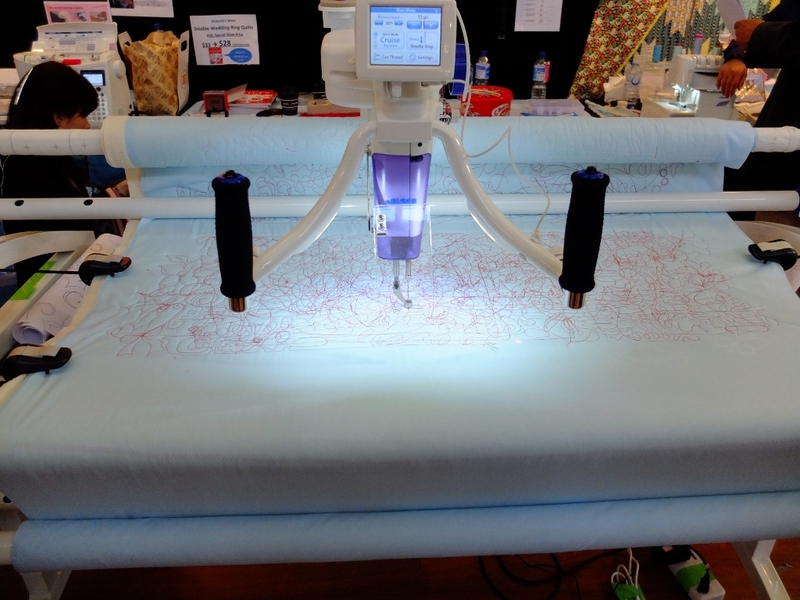 I made it to the Australasian Quilt Convention in Melbourne last month and really enjoyed myself. 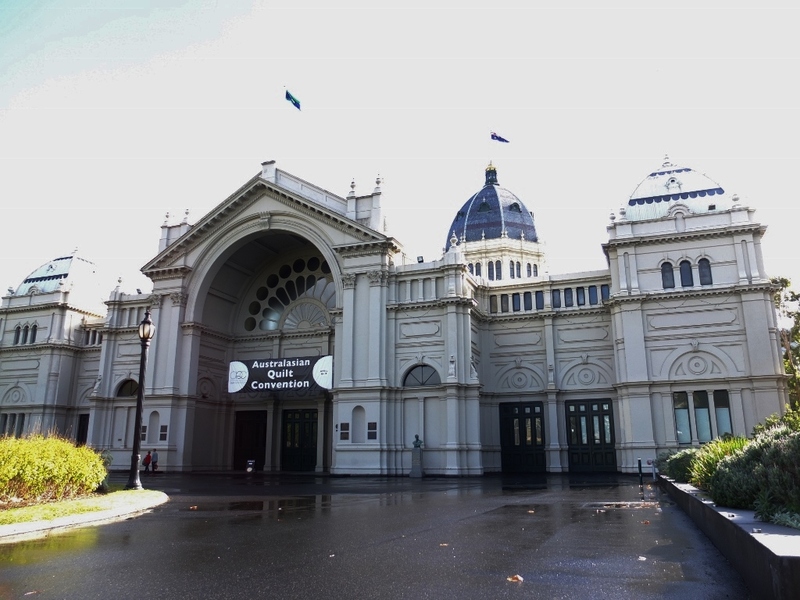 It’s held in the Royal Exhibition Building which I’ve often walked past and wanted to look around so this served a dual purpose of allowing me to finally get a bit of a tour. 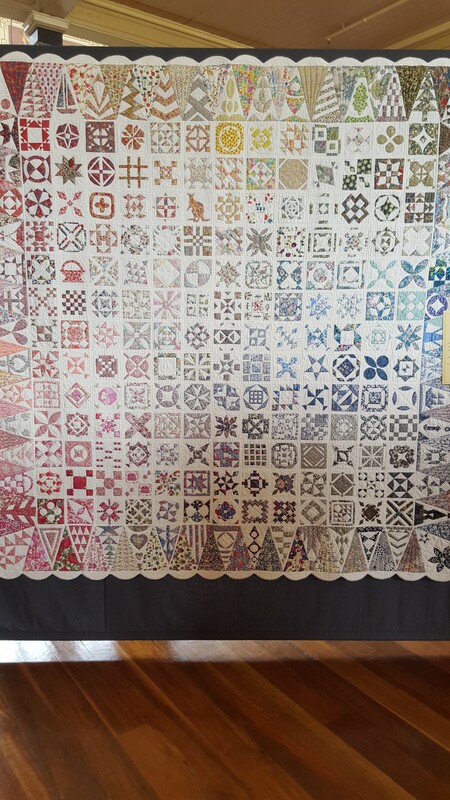 The exhibition itself was split about evenly between vendors and the exhibition of competing quilts – I restrained myself from spending too much but got a new rotary cutter and a few fat quarters, plus a whoooole stack of pamphlets for machines for me to lust after. 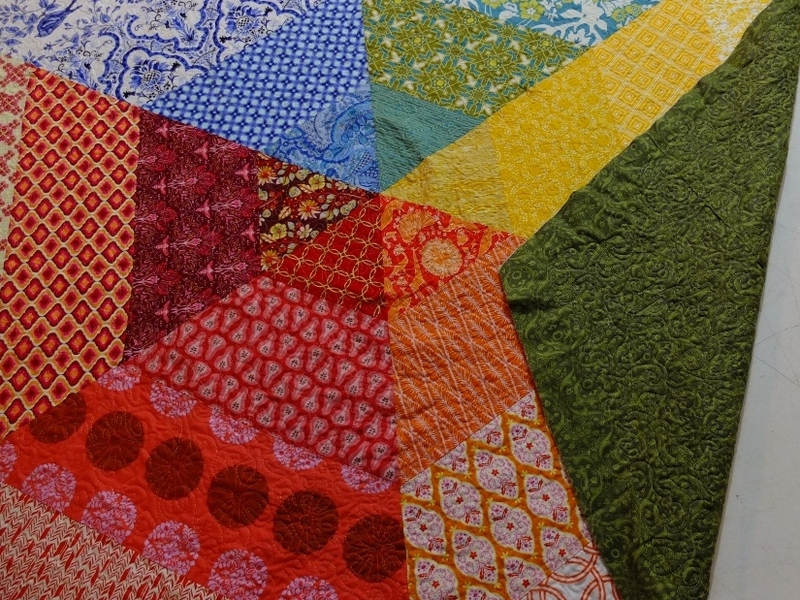 The quilts I was most taken with in the exhibition were the wholecloth quilts and those which used a couple of very large blocks of colour and very fine and detailed quilting. 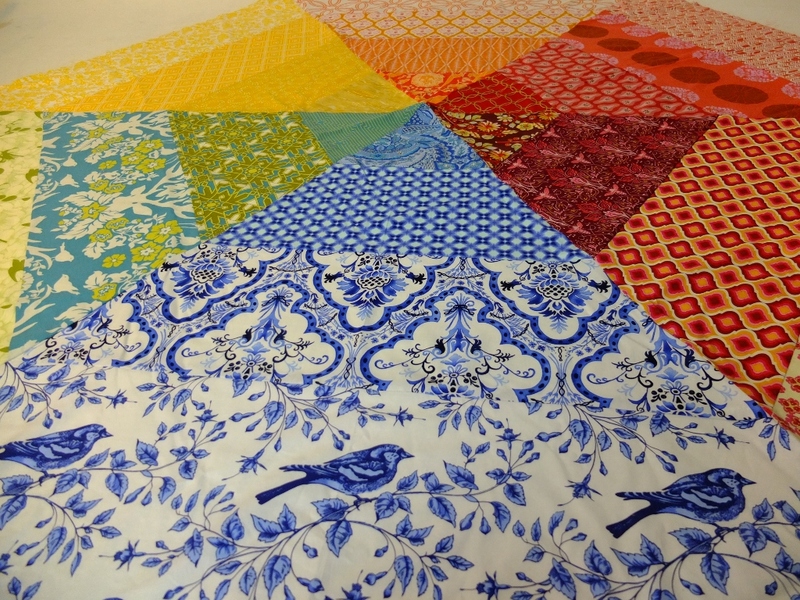 And this is a detail shot of Turkish Delight by Phillipa Thomas. I’m particularly fond of her use of silk as a construction fabric – as much as I love patterned cottons I’ve been interested in using other materials for some time (I think I posted a sample block of a chevron quilt pattern in dupioni silk a few years back) and it’s exciting to see someone constructing a bed sized quilt out of silk. I should also add that the posted information about sharing photos from the exhibition indicated it was allowed as long as appropriate credit was given to the makers – if anyone whose work is featured in this post would like the images removed please leave me a comment and I’ll take them down immediately. 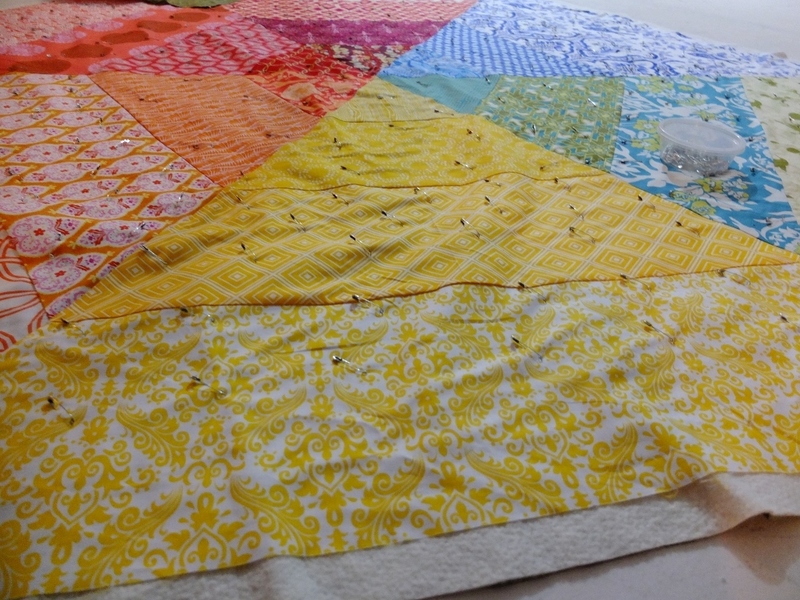 As for my own quilting, I’ve been working on a chevron commissioned quilt – it’s close to done, actually. 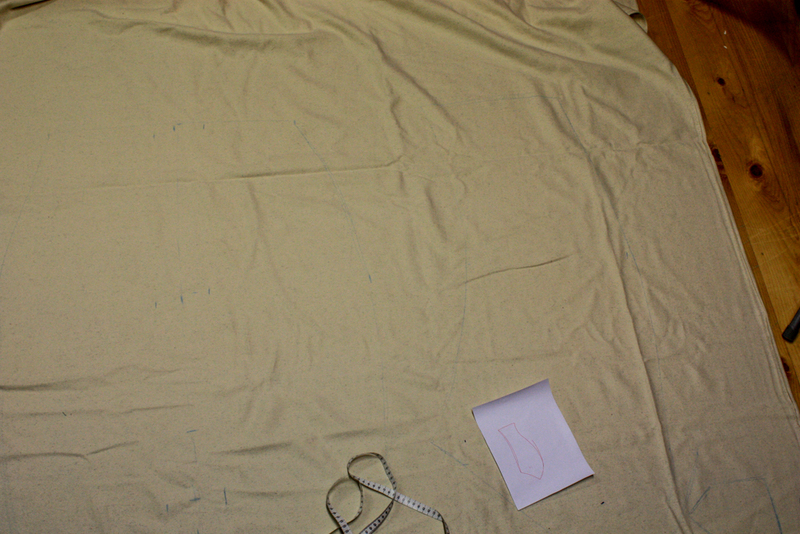 Some pictures of it in progress (I’ve been sewing it while visiting my Grandma). Toasty warm in front of the fire. George stayed home, but Pudding here helped with the all important basting process, making sure the fabric didn’t move while I was pinning it. 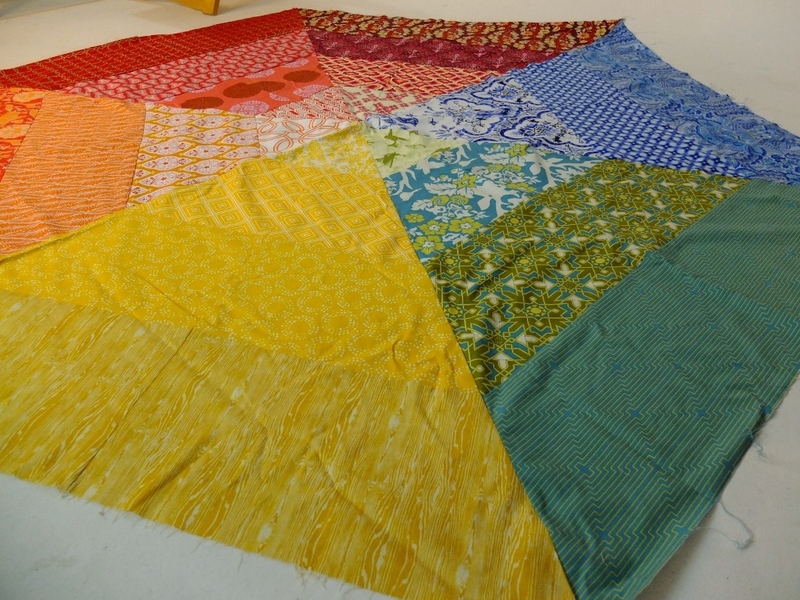 Remember the rainbow gradient quilts I mentioned in my last post? They’re coming along nicely! One (at the top of this post) has already been spoken for (a pal saw my upload of it on Instagram and asked if she could dibs it). 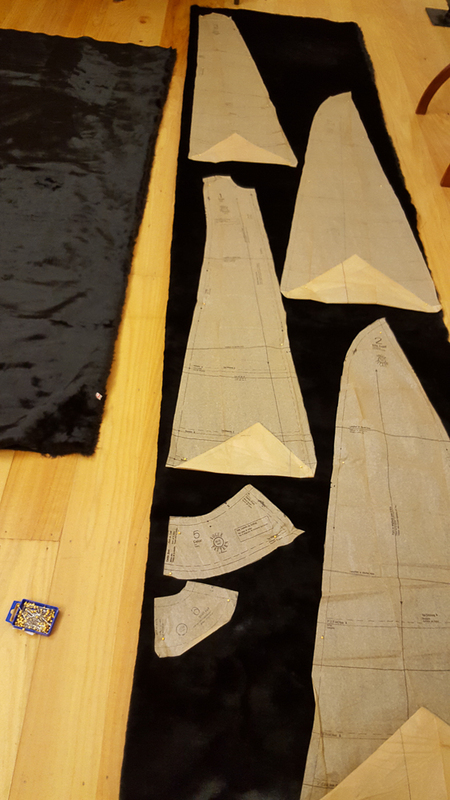 The tops are all sewn together and they’re just waiting on the batting arrive. 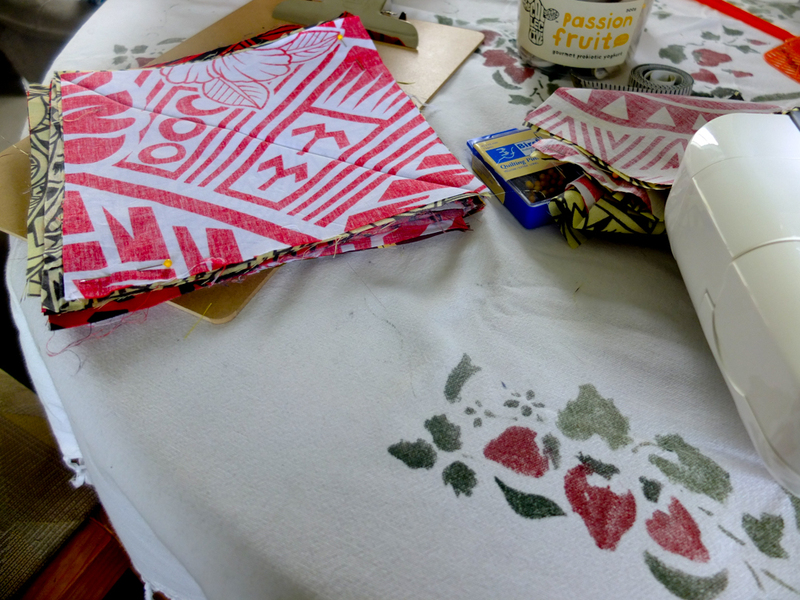 I’m going back to cotton/bamboo batting I’ve raved about so much and I’m making the most of the luxury of space in my studio by ordering a whole roll of it. I can’t wait. I also bought a proper quilting foot and I’ve figured out how to make my poor beleagued BM-2600 do free motion quilting, I hope. 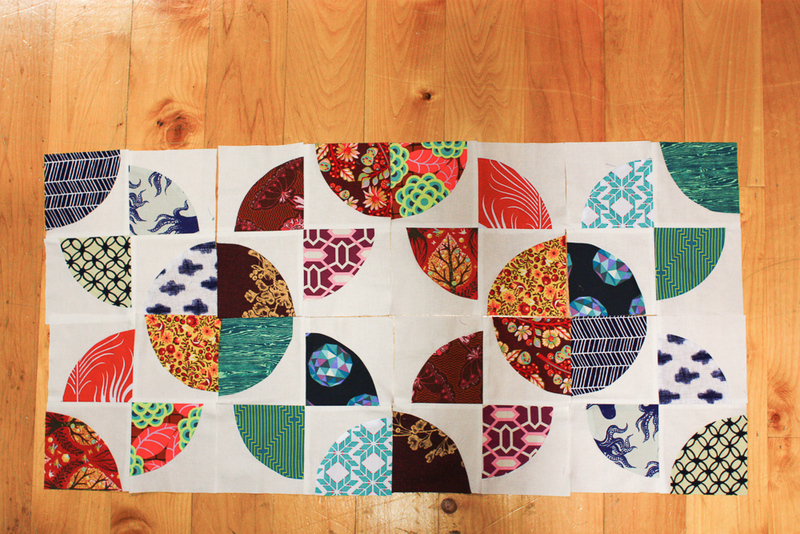 I’m planning a kind of spirograph inspired pattern with the quilting – riffing off the hexagonal shape of them. I’ve also got a custom commission in the works. 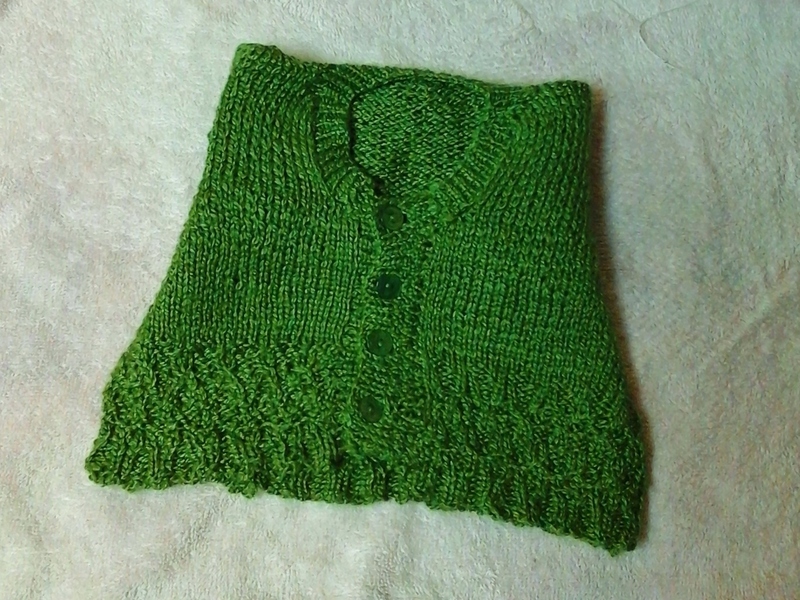 It’s for a friend’s mother who is a sportsmad Dundein-ite who apparently sits up until the wee small hours in the bitter cold to cheer for her teams and needs something to keep her warm as she does so. 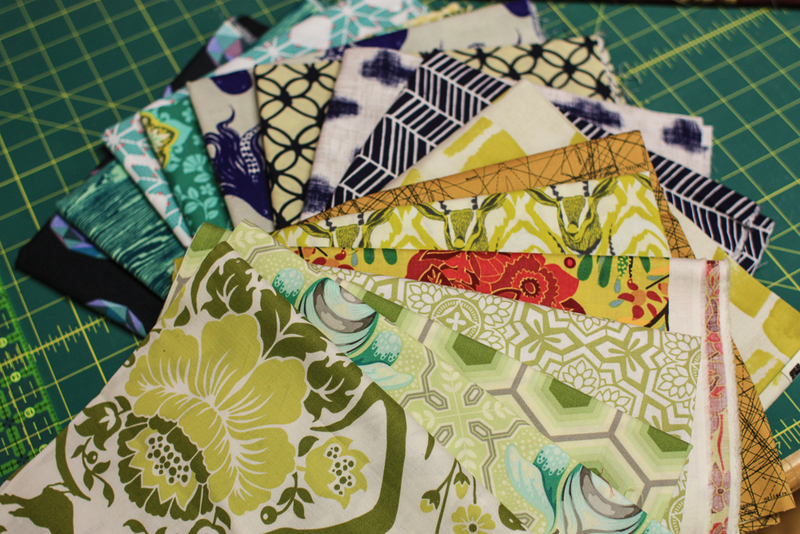 I pulled the fabrics for it from my stash this afternoon and I’ll be cutting them tomorrow. I’m thinking something similar to the chevrons I did last year since it’s still one of my favourite patterns and will come together quickly. I took some snaps hastily on my tablet before posting it off so the first of these two photos is closest to the actual colour. It’s only the second actual garment I’ve knitted; I usually stick to simpler things like scarves which have decidedly more margin for error. 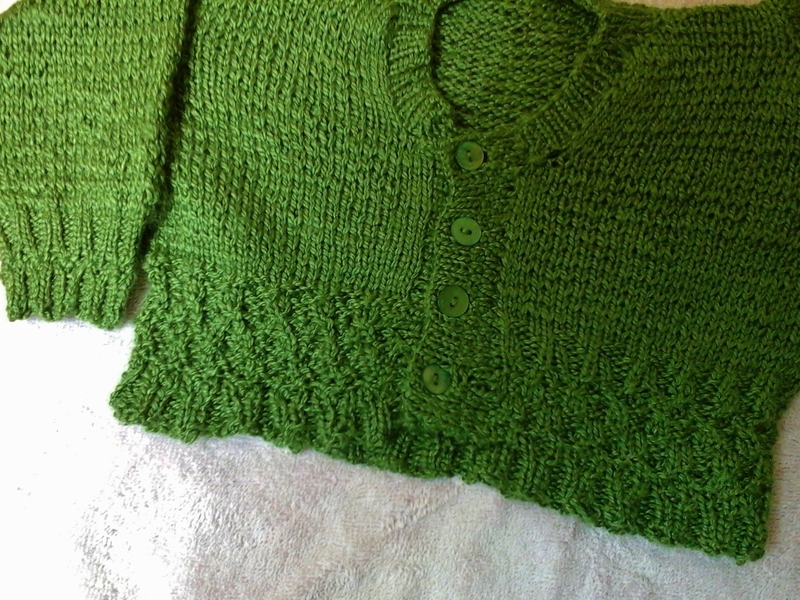 I only had to frog a couple of rows and those were mostly because I tried to knit while flying through turbulence. Learn from my mistakes. Turbulence is the universe telling you to just sit tight and enjoy another complimentary wine rather than trying to cable anything. I have the gorgeous red cotton from a few months back coming together as a cabled hat right now – my first attempt at knitting in the round. So far I’m not the biggest fan of knitting in the round, it seems to go much slower than I’d like but the cotton is dreamy to work with so I’ll make do. I also have not one but TWO generous colleagues in Australia offering to show me how to crochet which I think I will enjoy. 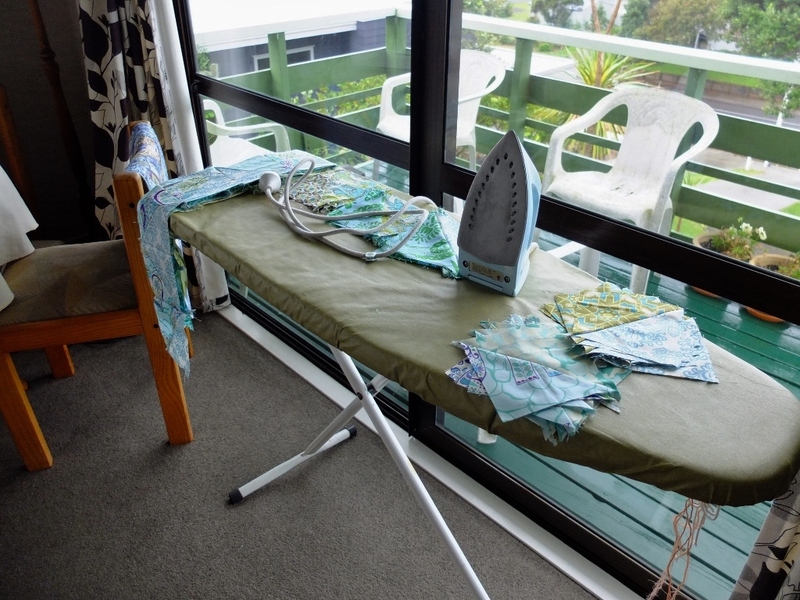 It looks a lot more portable than knitting (one needle, rather than 2 to 5). Also! I realised I never did come through with my promise to show off the truly enormous rainbow quilt from a few years back. 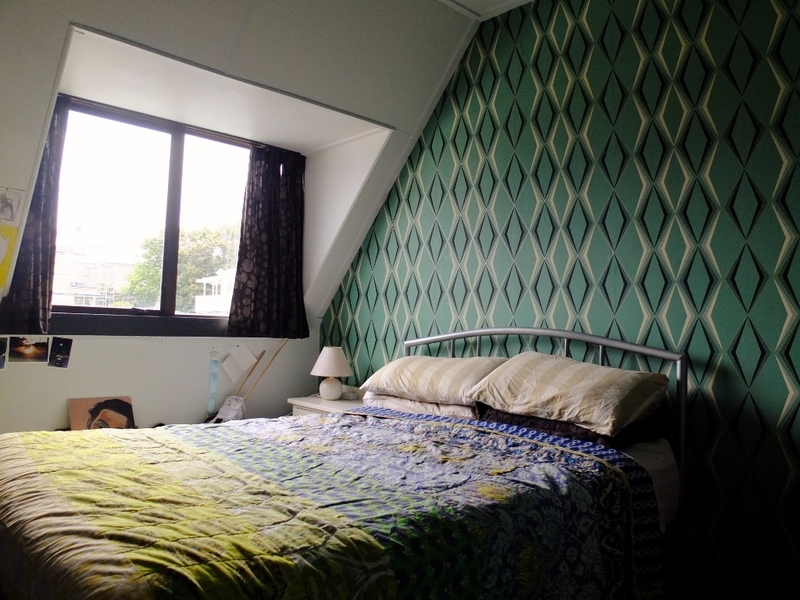 It lives on our bed now and our latest redecoration means it now matches the bedroom. Finally, to make up for this fairly scant post have a truly hilarious author photo, courtesy of a friend of mine. My current portrait aesthetic seems to be ‘austere’ which is quite at odds from the saturated colour work I’m doing but never mind.